4. Generations Game 5. Meek midwinter 6. Extras! Extras! What better way to salve the trauma of parting with my long-term V-Class than to replace it with something even more elevated in the echelons of three-pointed star luxury? Certainly works for me, hence why for the next six months I’ll be wafting around in a Mercedes-Benz S-Class Saloon – Parkers’ reigning Luxury Car of the Year, no less. Is it a fire-spitting AMG fettled one? Dear boy, how terribly unnecessary. No, representing nine out of every ten S-Classes sold in the UK, the one I’m the custodian of sips diesel rather than swigging super unleaded at a frightening rate. 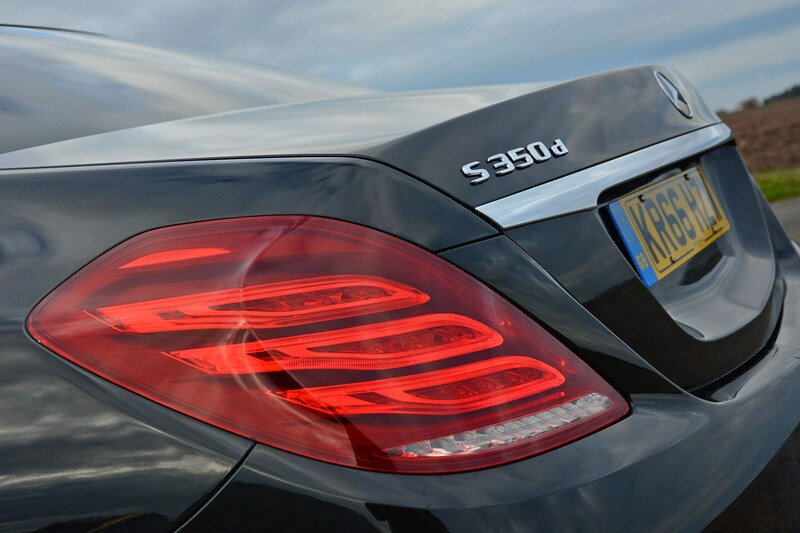 Pay little heed to the S 350 d badge on the bootlid, for this is another example of Mercedes misdirection in order to make customers feel rather better-endowed than they really are. Still, under that hectare of bonnet dwells a 3.0-litre V6 diesel producing a very healthy 258hp at 3,600rpm and a welcome 620Nm of torque from just 1,600rpm. Simply put, this 1,955kg limousine will scamper from a standstill to 62mph in a sprightly 6.8 seconds, and on to an electronically governed 155mph top speed. Surely that must dent the economy? Inevitably it will if you drive it balls-out most of the time, but efficiency is acceptable the rest of the time: witness an initial return of 33.0mpg over the course of its first 882 miles in my hands. Sure, that’s considerably shy of the claimed 50.4mpg average, but there’s still time for the engine to loosen-up. 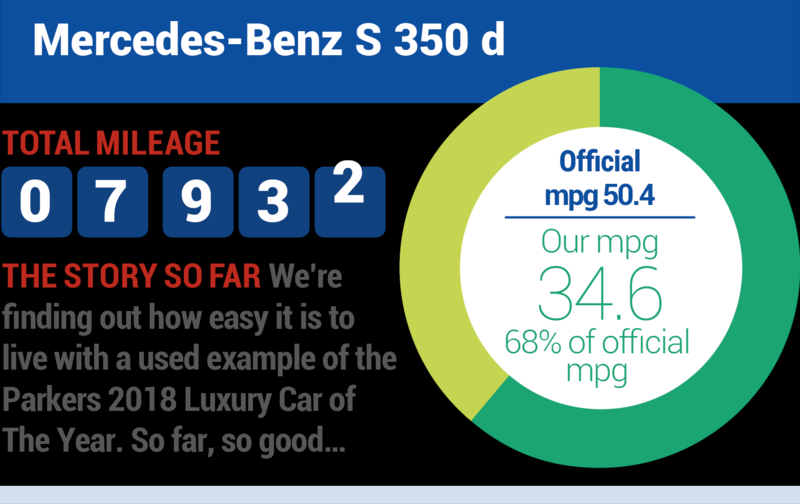 What is immediately evident is that the S 350 d is significantly more economical at motorway speeds than the V-Class was, thanks largely to its ability to cleave through the air with greater aerodynamic efficiency. It’s not abysmal around town either, with an unobtrusive stop-start system saving wasting diesel in urban crawls, although note that this fuel-saving feature only works in Eco mode and not Sport. Pity that, as getaways are surprisingly sedate in the former. There’s a simple reason for this: it’s the AMG Line trim level, giving buyers that sportier appearance they crave (see also S Line Audis and M Sport BMWs), but with the more modest running costs associated with an economical – relatively speaking – diesel. Chief among the changes over the less-fancied SE spec are a beefier bodykit with larger grilles in the front bumper, side sill extensions, AMG-specific alloy wheels (upgraded to 20-inchers on this one from the standard 19s) and a darker interior treatment characterised by the gloss black finish to the poplar wood appliques. However, given its position at the pinnacle of the range there are lashings of chrome to adorn the bodywork, including the traditional Mercedes grille, complete with the brand’s bonnet ornament stood proudly at tip of the prow. Seeing it from the driver’s seat never fails to make me feel warmly satisfied. 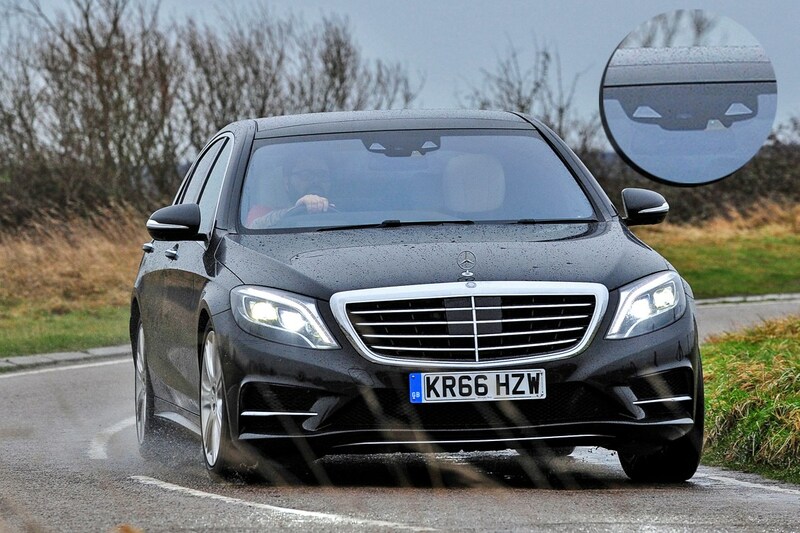 Specifically, this is an AMG Line L – the suffix denoting this is a long-wheelbase S-Class. Confusing matters somewhat, if the gargantuan Mercedes-Maybach version is included, it’s the middle-length Saloon body, and the most popular. At 5,246mm nose to tail, it’s far from petite. 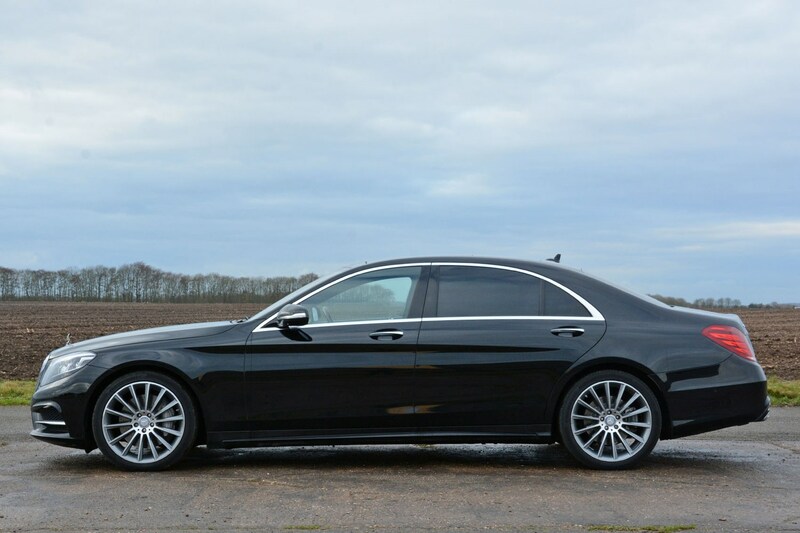 I’ll explore the specifications in more detail in a future update, but when it was new this S 350 d cost a not inconsiderable £73,580 to which an eye-widening (and watering) £34,755 of optional extras were added, ramping the total up to £108,335. In fact, so wide and varied are the range of options here that they’ll require an update – or two – to explore alone. Good job I was sat down – but what do you mean ‘when it was new’? Yes, there are clues beyond the 66-plate registration that this is not a brand spanking new S-Class, not least that it doesn’t enjoy the mild makeover that Saloons have had since September 2017. No surprise that another future update will examine the differences between pre- and post-facelift S-Classes. 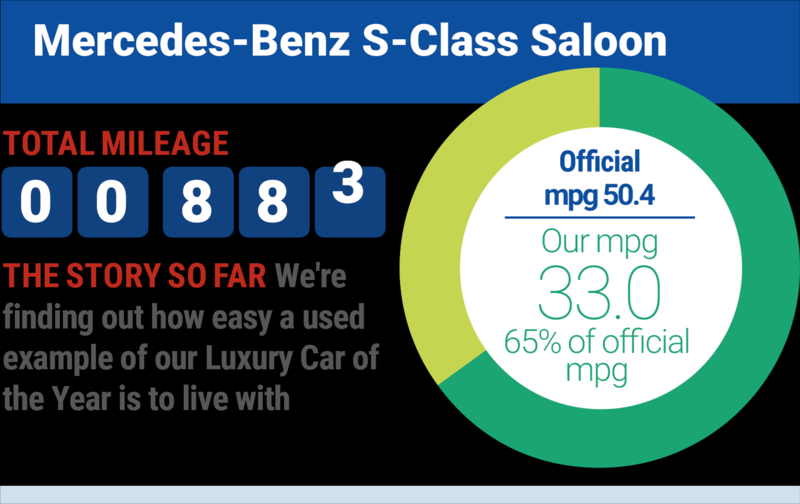 What it also means that running the S 350 d as a used car allows us to explore Mercedes’ approved used car scheme as well as keep tabs on the depreciation rate of this svelte four-door. 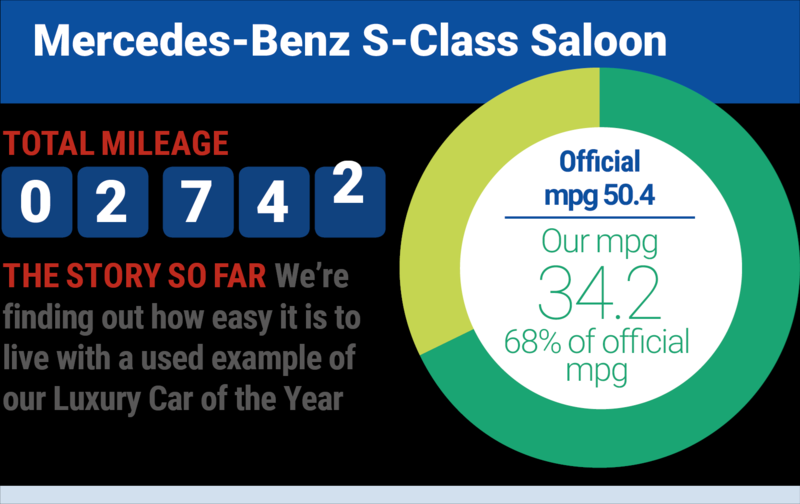 It’s already clear how much of a hit S-Classes take in their first year, too. 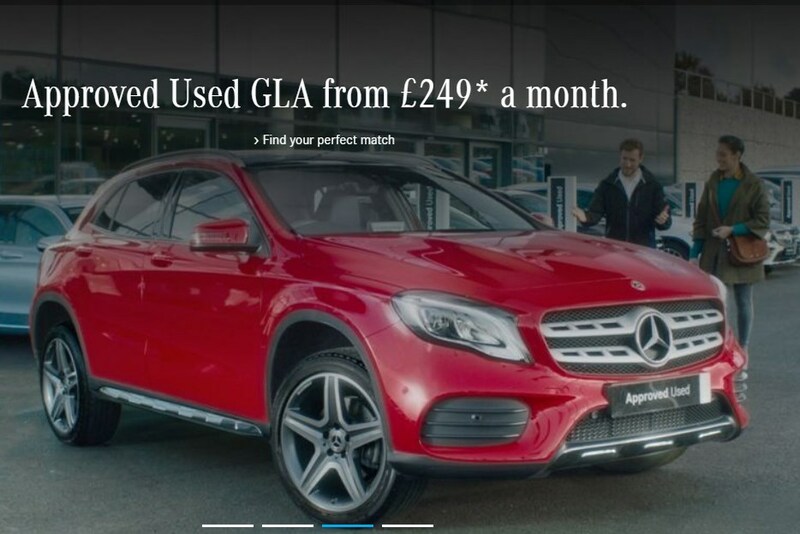 After 11 months and 4,992 miles, a Mercedes-Benz retailer would advertise the long-termer at £89,625. Whether it would achieve such a figure – representing just an 18% drop – is unlikely. We’d envisage the final transaction price to be in the low-£80,000s. How good are the first impressions? Almost 1,000 miles under its belt and so far the S 350 d AMG Line L is everything I hoped it would be as a long-termer. Imperiously imposing, calmingly comfortable, mile-shorteningly rapid – a beautifully composed feelgood machine. My biggest problem is looking convincing enough to onlookers for them to think I might actually own the S-Class: I feel like a teaboy who’s accidentally stumbled into the company directors’ private dining room. Anyway, must dash – I have some plebs to sneer at as I tootle past Lidl. V-Class? What V-Class?? New. It’s a word that’s endlessly bandied about in the marketing departments of various car manufacturers as a euphemism for ‘modest modifications to an existing model’. A timely titivation in the form of a freshening facelift might be insignificant with regards to the degree of change, but that doesn’t stop the adverts and sales literature from being emblazoned with ‘NEW’ with infuriating regularitty. 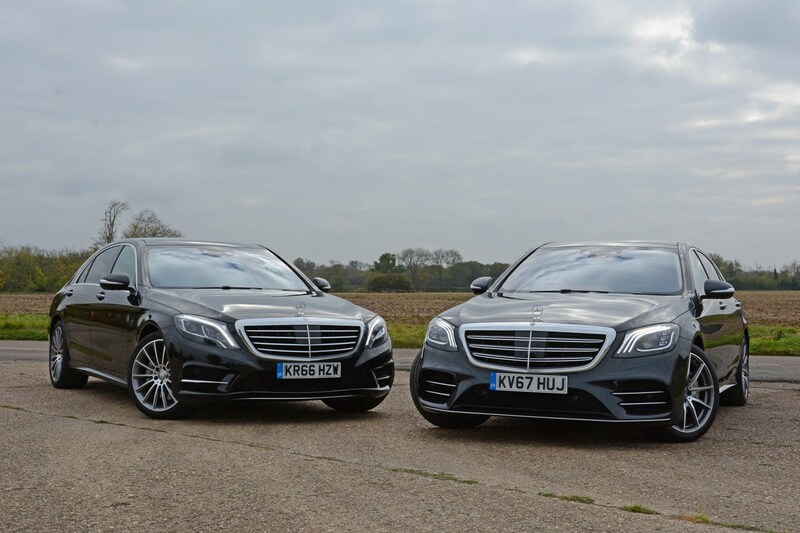 Mercedes-Benz is one of the exceptions: you see, the S-Class on the left is Parkers’ year-old long-termer, looking essentially as it did when this W222-generation saloon debuted back in 2013, while the one on the right is the new one, as sold box fresh from the tail end of 2017. Yet there’s scarce use of the n-word in the brochure. Visually, the changes are minor, tantamount to a soupcon of botox to ease the effects of crow’s feet – that’s not the voice of personal experience before you ask. That subtlety is deliberate: for one it won’t annoy buyers of the pre-facelift S-Class too much due to the lightness of the refresh, while it nevertheless helps keep the S-Class looking current in the face of genuinely new opposition – Audi A8 and Lexus LS in this case. 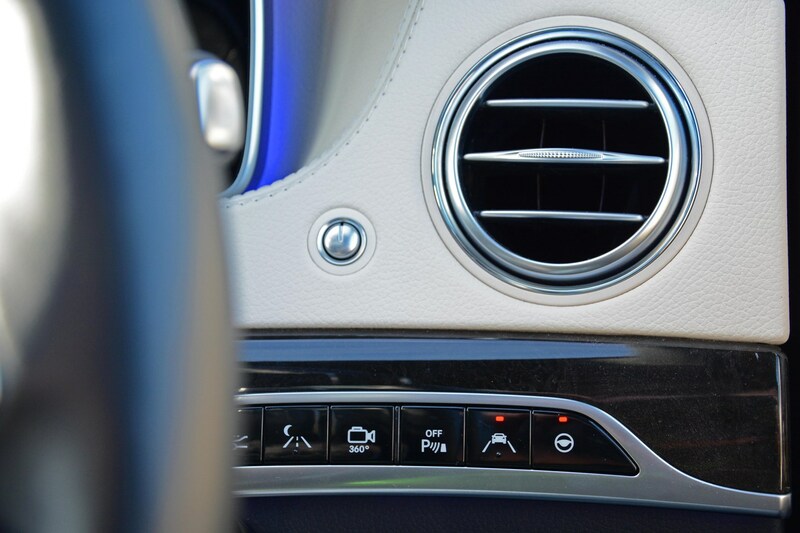 There are no changes to the sheet metalwork here – all the alterations have been made to ‘softer’ parts of the S-Class’s design. From the outside it’s the front that’s had the most attention, with a new bumper, a revised grille infill and upgraded adaptive LED headlights with three-section day-running lights cascading downwards. 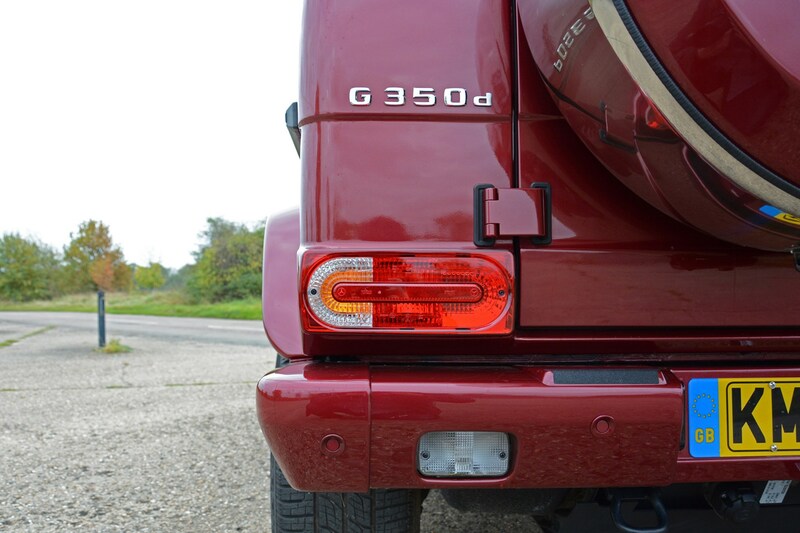 Revised LED tail lamps feature at the back, along with another tweaked bumper. Inside, the alterations for the 2017 vintage S-Class are equally restrained – aside from the elephant in the room that is the Exclusive nappa leather option featured here in a natty Mahogany Brown and Silk Beige combo. It feels sumptuous – and less arresting colour combinations are available for those feeling less bold. There’s a dash of E-Classisation to the dual screens that make up the instrumentation and multimedia displays, with both now nestled behind a single pane of glass – it’s a far slicker arrangement, amplified by the updated graphics and a choice of styles for the instruments. The optional head-up display has also been sharpened-up in terms of clarity, while there are minor alterations to the multimedia controller and its operating system. Perceived – and actual – quality is improved too, courtesy of an increased amount of leather swathing the dashboard – including a quilted panel ahead of the passenger, while the frameless rear-view mirror looks classier. Jumping from seven to 64, the number of hues for the ambient LED lighting has increased significantly, plus there are various multi-coloured animated settings that gently rotate between colours. Increase the climate control temperature and the lights in your corner of the S-Class temporarily glow red, or blue when you lower it. Obviously, you get used to it relatively quickly, but for me it’s a retrograde – and unnecessary – ‘improvement’. All of this seemingly insignificant tinkering hides the mechanical overhaul the S 350 d has undergone, with a new engine and gearbox combination adding even more lustre to what’s an otherwise exceptional luxury saloon. Forget that the badging has stayed the same, in place of our S-Class’s 3.0-litre V6 is a new 2.9-litre in-line six-cylinder diesel. Not only is it smoother and quieter, power has increased from 258hp to 286hp, although the S 350 d’s top speed remains electronically capped at 155mph. At 600Nm the peak torque figure is 20Nm down with the new engine, but because it’s available through a wider band of revs – 1,200-3,200rpm versus the old motor’s 1,600-2,400rpm – it accelerates quicker, as well as being more flexible for overtaking. Stat fans should note that the new S 350 d will sprint from 6.0 seconds, some eight-tenths of a second faster than in our S-Class. Seemingly you can have your cake and eat it, too: Mercedes also quotes improved efficiency figures with the latest S-Class diesel at 52.3mpg compared with our version’s 50.4mpg – in the real world you’re looking at 39mpg instead of 33mpg. The new nine-speed automatic gearbox helps here, with a coasting function to disengage the drive to the rear wheels when the throttle’s not been applied. On the downside, there was a more obvious shove at lower speeds as it changed down through the ratios. So, out with the old? It’ll be a different matter when the seventh-generation S-Class appears early in the next decade, but for now owners of the pre-facelift iteration of the current car won’t feel too green-eyed about the 2017-issue tweaks. 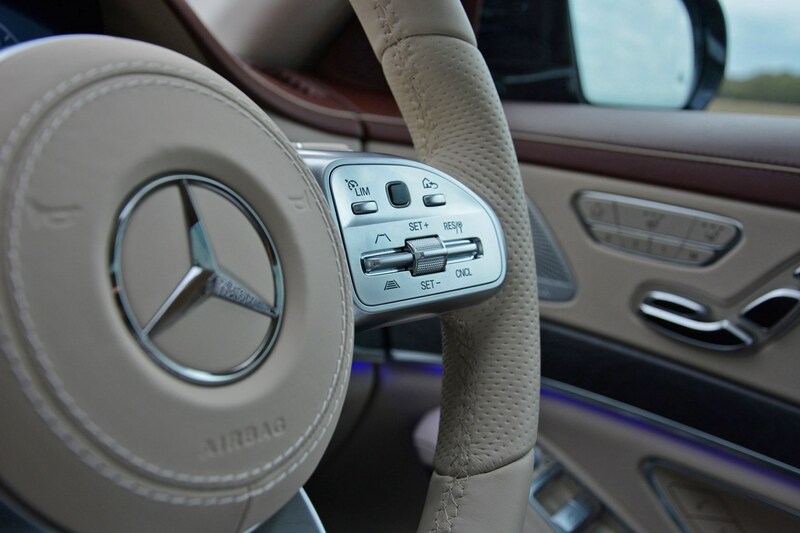 New S-Class customers will doubtless appreciate the cabin enhancements and the improved diesel efficiency, but for those piloting a 2013-2017 era S-Class, relax in the knowledge that you’re still driving one of the finest cars around. London: the epicentre of magnificently dimensioned Mercedes-Benzes, where the cityscape’s populated with numerous examples of the V-Class, S-Class and G-Class ranges. The V-Class makes sense as a luxurious way to ferry about up to eight passengers without resorting to something as demeaning as public transport, while the S-Class is deservedly the default prestige saloon, but the G-Class? Really? As one of the world’s most capable 4x4s, central London is patently the natural habitat (insert eye-roll) for Mercedes’ Geländewagen – or all-terrain car. But given the propensity of SUVs that now pepper our roads, it’s no surprise that expensive, high-end earlier G-Series and more recent G-Classes (it was never officially called G-Wagen in the UK) are a relatively common sight in the capital. Beyond the M25 they’re seldom seen in the UK. My non-car-enthusing brother told me some years ago of seeing a ‘curious Mercedes Land Rover’; odd given its market longevity that it’s not more widely known – after all, few cars have endured the passage of time like the G-Class: it’s the automotive equivalent of Kirk Douglas. Powering this G is the same 3.0-litre V6 diesel that our long-term S 350 d uses, although it’s slightly detuned to 245hp instead of 258hp. Usefully, with 600Nm of torque being distributed via all four wheels from just 1,600rpm, it’s no slouch. 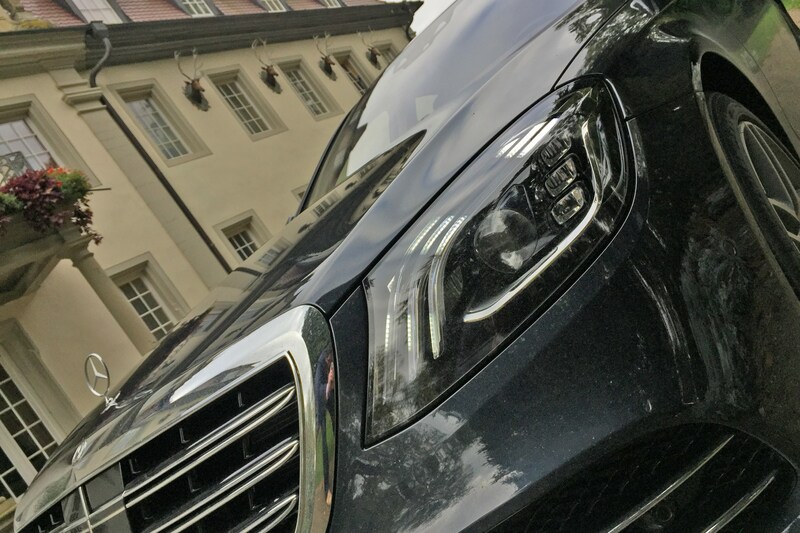 Courtesy of aerodynamics akin to those of Buckingham Palace, top speed is held to 119mph (although it feels eye-wideningly quick at motorway speeds), while the 0-62mph dash requires just 8.9 seconds – impressive for an SUV weighing in at over 2.5 tonnes. It’s thirsty, mind: obviously not as bad as the petrol-fuelled AMG G 63, which would have out-drunk Oliver Reed in his prime, but you’ll be doing exceptionally well to average 25mpg in the real world. 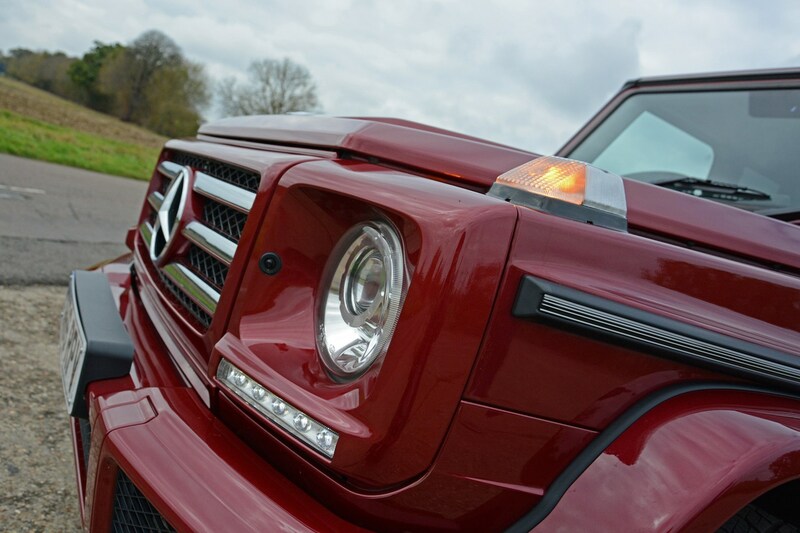 Handling is best described as old-fashioned, again, not really a surprise given the G-Class first appeared in 1979. In spite of a couple of overhauls, it’s remained fundamentally similar since. 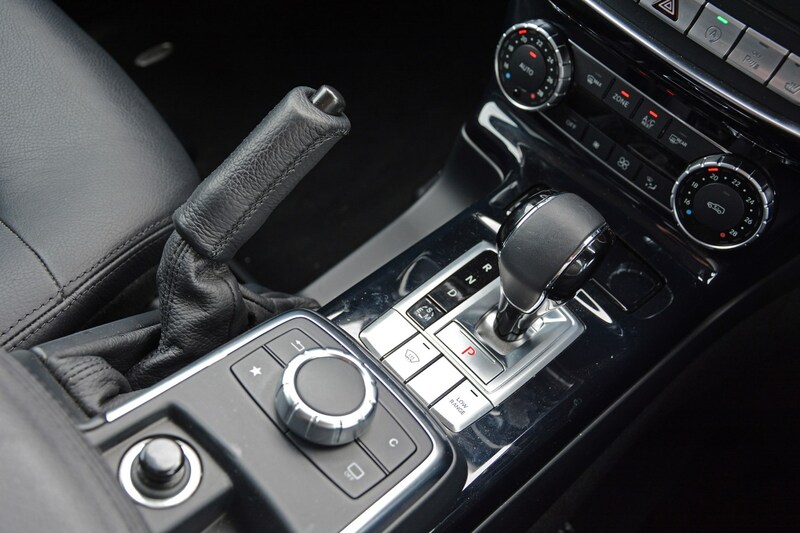 The steering in particular takes some getting used to – it’s a recirculating ball arrangement, rather than the more common and communicative rack and pinion system fitted to almost every other new car. Transplant this to a windy B-road and you have to think slightly ahead as though there’s a satellite delay between turning the steering wheel and the front axle responding with a change of direction. Considering the distance between your posterior and the road, you’re not as well-isolated from ruts and imperfections as you might imagine – none of the S-Class’s air suspension comfort is going on here. Plus, the cabin feels snug by today’s standards and you’re sat very upright. Dr Dre once pondered ‘the hell if I know, do I want leather seats or vinyl?’, but this isn’t a question G-Class buyers face – forget its fairly rudimentary unpretentious origins, these days it’s a luxury car. Or at least, luxuriously appointed. A full hide interior, a high-end multimedia system, climate control, bi-xenon headlamps, parking sensors and a high-mounted reversing camera feel at odds with the set-square styling and completely flat glass, but they make the G easier to live with all the same. Extras fitted to this example include an electric steel sunroof (£1,660 and noisier than a caravanning holiday in a wind turbine) and twin rear video screens with TV connection (useful for kids in the back but difficult to justify at £2,995). Plus there’s a visual makeover in the forms of the Designo black piano lacquered veneers (£2,510) and a Sports Styling package (£2,995) with additional bright trims, running boards and matt-black 19-inch wheels for the outside, velour mats and extra wooden appliques for the interior. To my eyes, it remains just on the right side of facing an arrest warrant from the taste police. Objectively the G-Class doesn’t fill the luxury car brief anywhere near as well as the formidable Mercedes S-Class does. 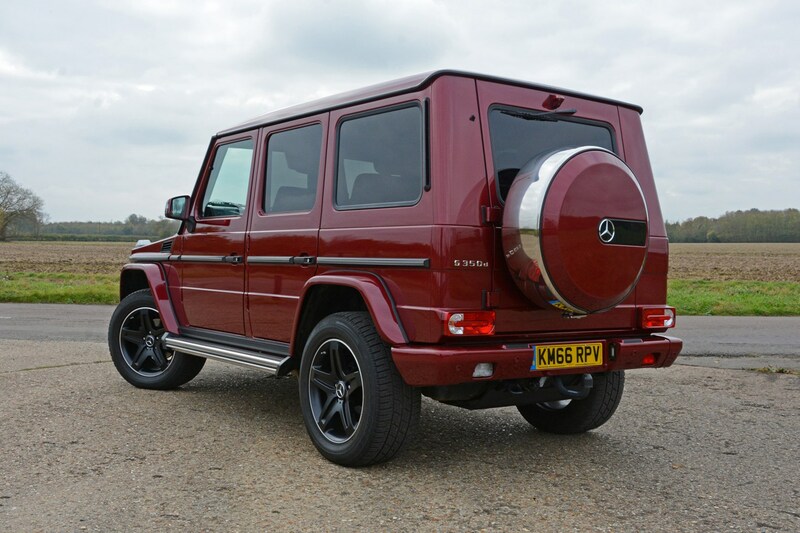 Perhaps committed G-Classers needn’t worry for much longer. After almost four decades of service, the current model will bow out in favour of an all-new one in 2018. 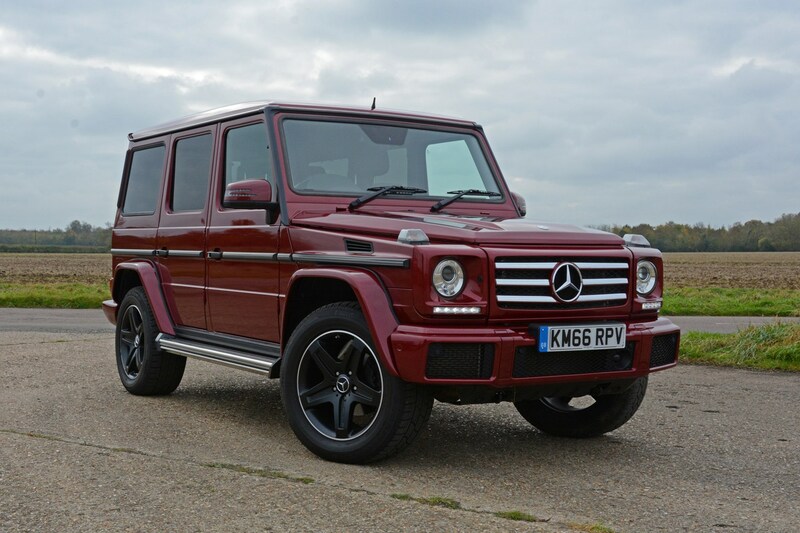 Set to be more comfortable – to be in and to drive – more efficient, with more contemporary Mercedes features, yet looking all-but-identical to its forebear, maybe I might be finally swayed by the G-Class’s charms. Right now, the S-Class remains my luxury Mercedes of choice. Update 4: Who do you think you are? Imagine if it was possible to be in the same room as your father, grandfather, great-grandfather, his father and his father’s father. Chances are that it’d be as equally amusing as it would be dumbfounding, about how similar you all were – not just physically, but in terms of personalities and habitual traits. 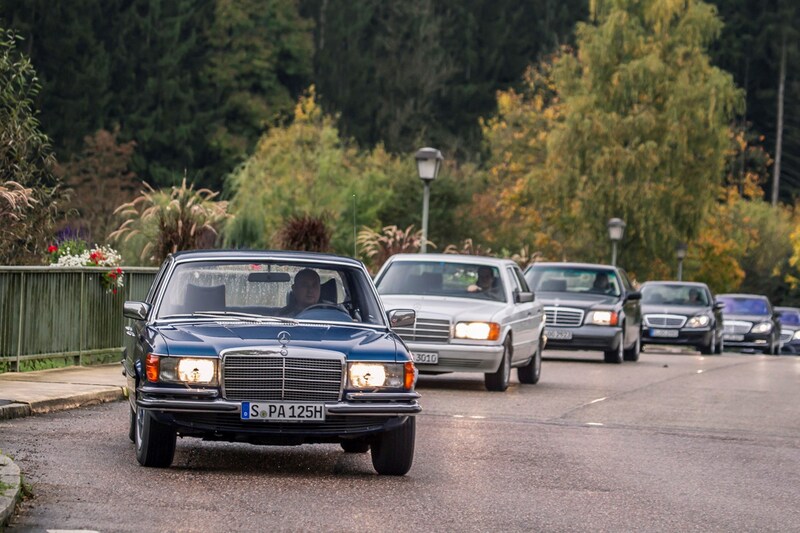 Recently, I had the opportunity to experience this in an automotive sense when a trip to Stuttgart resulted in the opportunity to drive all six generations of Mercedes-Benz S-Class back to back. Would there be a common feel to our long-termer’s forefathers that extended beyond a purposeful grille topped by a three-pointed star? For almost as long as there have been Mercedes-badged cars there have been models with an S in the model name, signifying their range-topping placement – and pricing – in the firm’s range. 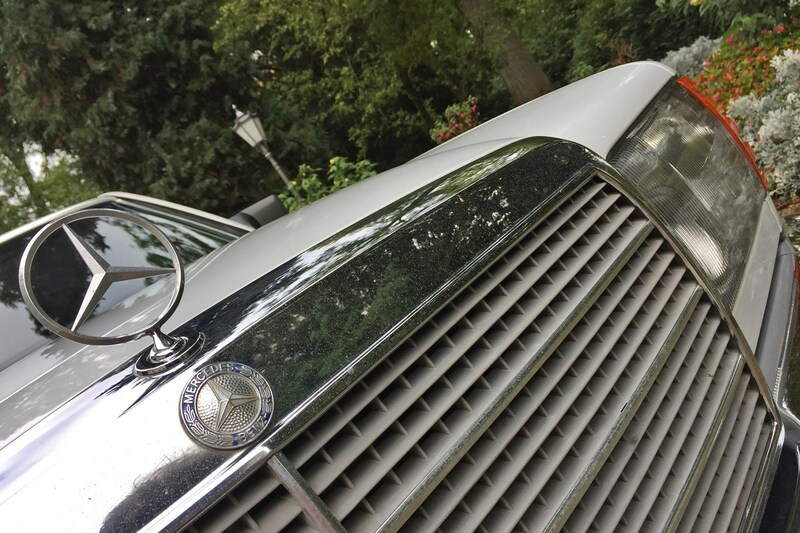 While some of these older cars are retrospectively called S-Class, it wasn’t until 1972 with the introduction of what’s known by Benz aficionados as the W116 (its internal codename) was the title formally applied to a range of luxury saloons. A slinkier two-door SEC coupe alternative to the imperious four-door saloon arrived following the introduction of the second S-Class iteration (the C126 and W126, respectively), but it wasn’t until the current – and sixth-generation – was launched that a third bodystyle, the Cabriolet (or A222), became available. Launching a large, luxury saloon on the eve of a major global oil crisis is more than a stroke of bad fortune, but it says much that the first S-Class was so well-engineered that it sold well, particularly in its least-expensive 280 SE form. It was the first car to pioneer many safety developments, including a large padded area in the centre of the steering wheel (this is pre-airbag, remember), enormous headlamps, ribbed rear lights (to help keep at least half of the lens visible when dirty) and recessed side windows (again to minimise the gathering of filth). While Mercedes-Benz didn’t develop the S-Class’s electronic ABS brakes – that was Bosch – models built from 1978 were the first series production cars to feature the system that’s effectively in use across the industry today. Sitting in the middle of the range towards the end of the W116’s life-cycle was this V8-powered 350 SE producing 205hp and an addictive exhaust note. It’s brisk in a straight line, but compared with modern standards it tends to roll significantly in corners, curtailing speeds on windier roads. Satisfyingly, the 350 SE is very comfortable if a little bouncy, and despite approaching 40 years old doesn’t feel especially aged by modern standards. In an era where enormous sideburns would crackle with static electricity when coming into contact with the wide collars on Bri-nylon shirts, it must have been a revelation. Immediately you’ll be struck that the Mk2 S-Class looks more aerodynamic (it did indeed cleave the air more efficiently), but what you can’t see is that it was also lighter and was powered with a new range of high-tech engines. 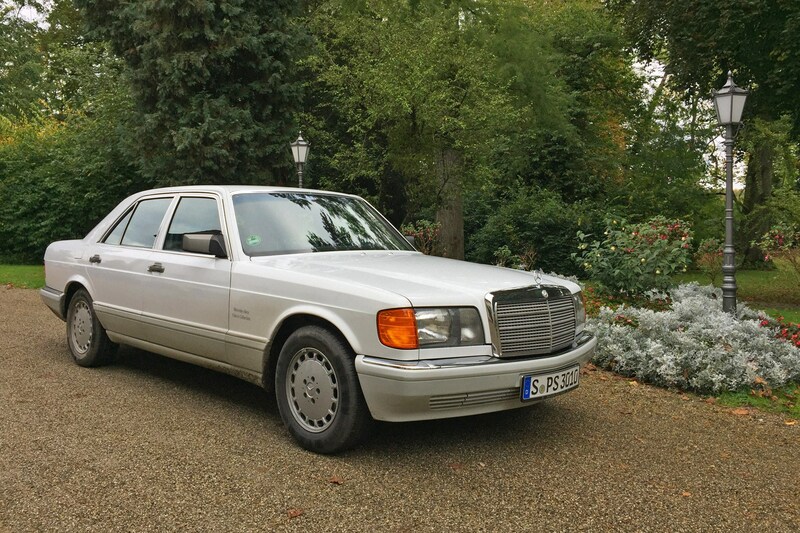 Back in 1980 when the first examples of the W126 S-Class reached Britain, most cars had metal bumpers, so a luxury car with plastic alternatives not only proved effective at negating the effects of minor parking knocks, they made it look modern. 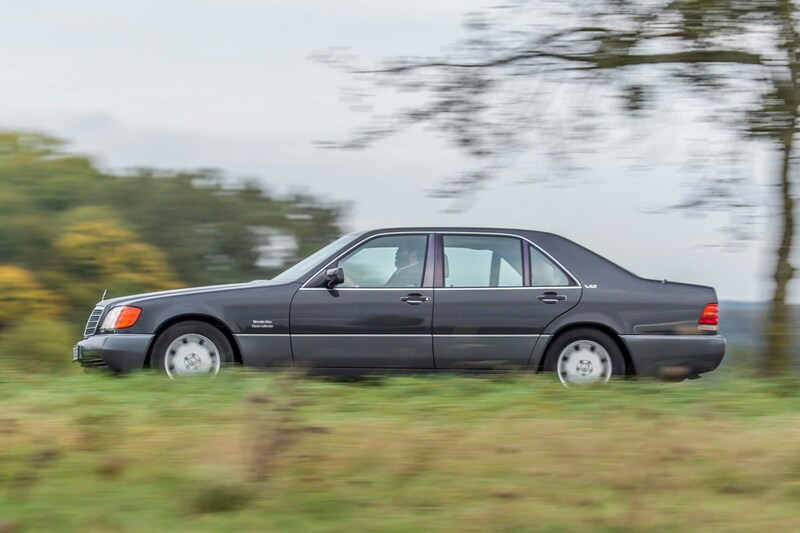 It also felt like a careful evolution of its predecessor, even in this late 300 SE example from 1990 – by this point this generation of S-Class was past its prime, but had appeal and prestige in spades. By modern tastes the interior kitted out in blue velour and wood veneers that look plasticky are off-beat, but it still feels well-constructed and easy to use. Being the entry-level model at the time – just 188hp was mustered by its 3.0-litre in-line six-cylinder engine – its performance is best described as adequate, but it was still comfortable, with added composure for maintaining momentum through bends. Do not overlook this generation of S-Class as a slab-sided behemoth: examples of a car being such a technological leap over the model it replaced are few and far between in the motor industry. Mercedes-Benz set out to produce what was technically the best car in the world: while there’s little doubt this was something it objectively achieved, even the well-heeled buying public saw it as too excessive, particularly as it arrived in the UK in the middle of another recession. Representing the peerless engineering excellence is this 1992 600 SEL (which would later be re-badged S 600 L), with a 406hp 6.0-litre engine. 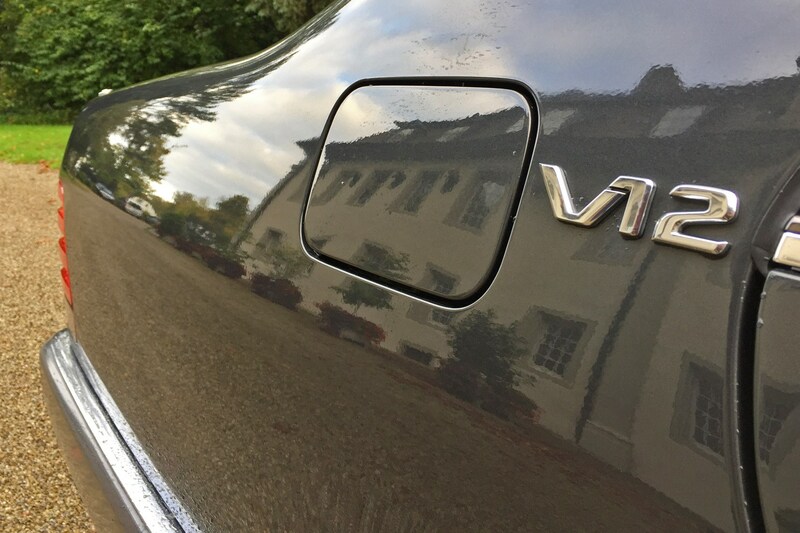 Those customers who didn’t believe in discretion doubtless revelled in the V12 badges on the C-pillars. Highlights? The sheer isolation from the outside world aided and abetted by double-glazing (but whisper that BMW beat Mercedes-Benz to this feature reaching the market) and (I can scarcely believe I’m typing this) an electrically adjustable internal rear-view mirror. Read that again without shaking your head in a combination of wonder and bafflement. 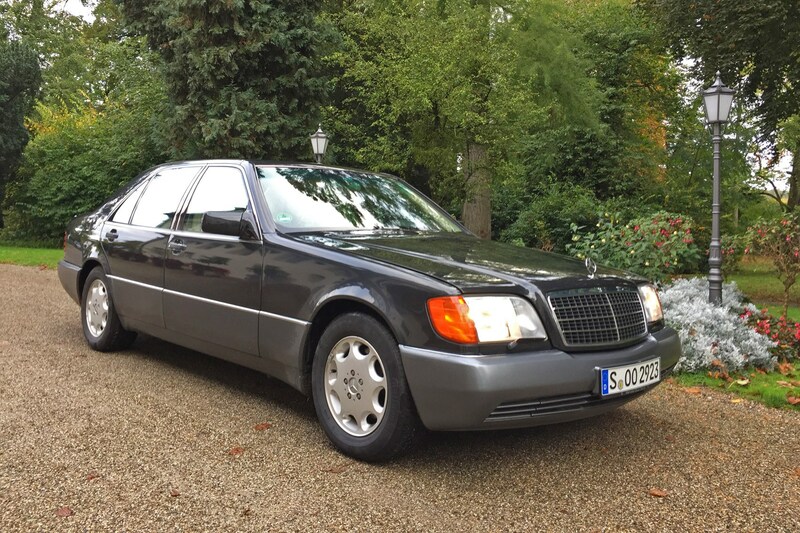 If the W140 was too-much-S-Class then perhaps the fourth-generation W220 wasn’t S-Class enough. It’s less imposing and almost apologetic about what it is, with smaller details and a swoopier overall styling treatment, almost as though it was paving the way for the CLS four-door coupe that was still a few years away. That big V12 was still available, but overall the car was lighter (auf wiedersehen heavy double-glazing), so it no longer cost as much as Luxembourg’s economy to run. 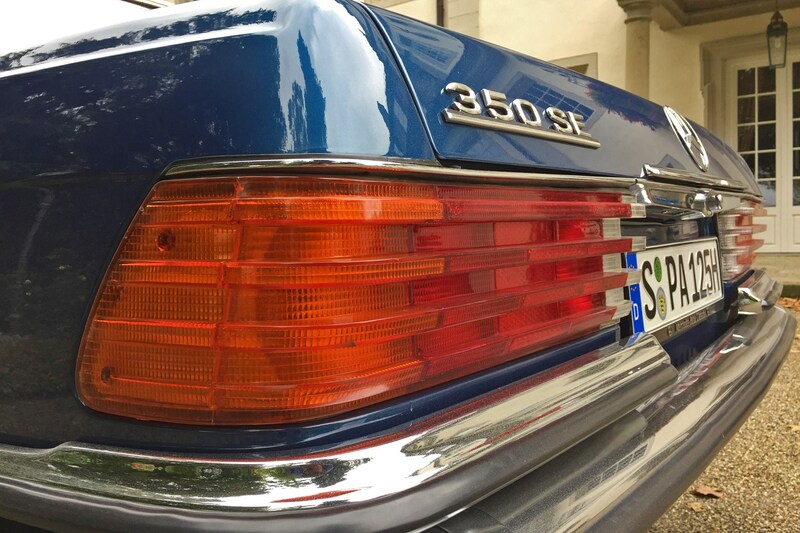 Thanks to being lighter – and with its adaptive Airmatic suspension – this S-Class was almost sporty, such was its agility, but it remained comfortable, just as the majority of customers rightly demanded. 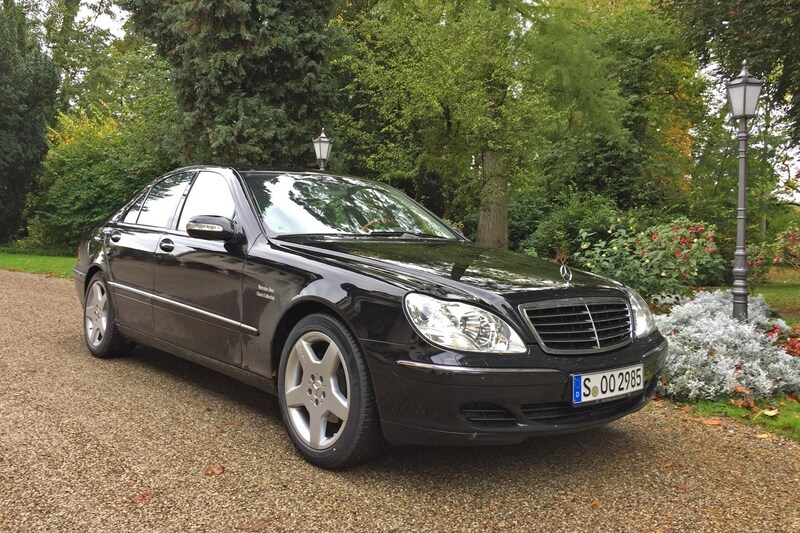 This particular 2002 S 350 features 4Matic four-wheel drive, something not available in Britain, but the 245hp 3.7-litre engine did make it here. 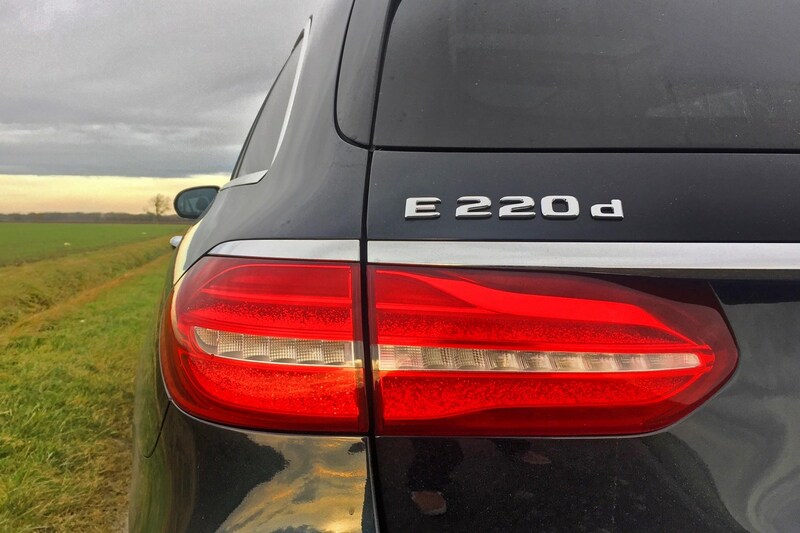 What a return to traditional form the W221 S-Class was: more imposing, greater solidity and higher quality – Mercedes-Benz had regained its luxury car mojo. While those exaggerated wheelarches and prestigious grille evoked themes from pre-war models, the on-board technology – semi-autonomous braking and lane-keeping assistance – are still filtering down to mainstream models today. By now the CLS was on sale, allowing the S-Class to be more obviously upmarket with an alternative choice for those who preferred the W220’s styling. Just don’t mention too loudly that the CLS was an E-Class underneath. 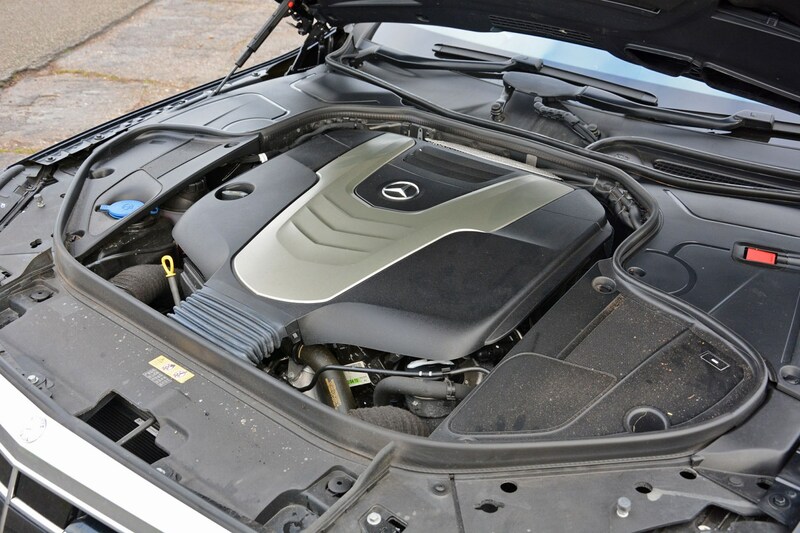 The W221 S-Class also marked the point in sales where diesel sales overtook those of petrol-engined versions, so sights such as this S 500 with its 435hp 4.7-litre V8 engine are few and far between. 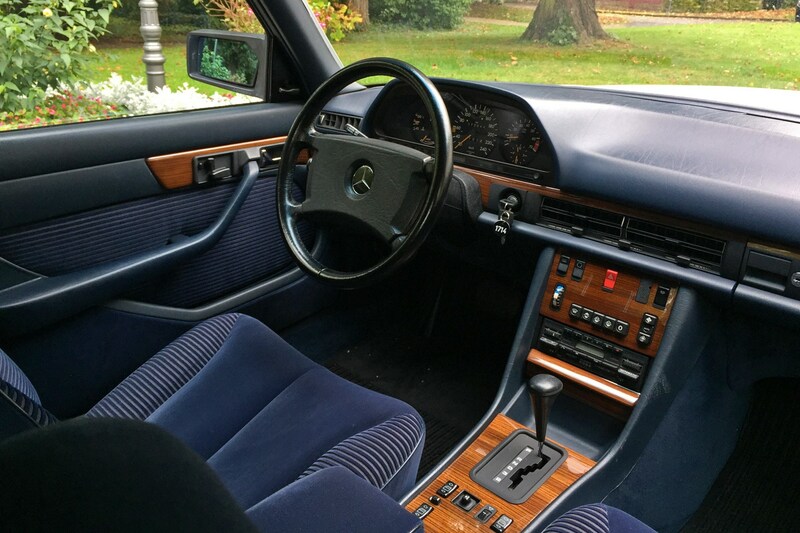 It’s a testament to how good this S-Class was that even when it went out of production it was still regarded as the best luxury saloon on sale. Hard to believe that the current W222 S-Class has been on the market long enough to warrant a little nip and tuck from the design team’s virtual scalpel at the end of 2017. It’s only a modest refresh – which says much about how effective the styling was back in 2013 – with tweaked lights, reprofiled bumpers and even more glitz inside. More important is what’s not immediately visible, particularly for the more than 90% of UK buyers who opt for the S 350 d diesel. As we described in an earlier update, there’s a new, more efficient 2.9-litre in-line six-cylinder in place of our long-termer’s 3.0-litre V6. The one in the photos – an S 560 4Matic – isn’t available in Britain at all, but arguably if you fancy a petrol-engined S-Class you’re best going for one of the astonishingly rapid Mercedes-AMG versions anyway. Is there an S-Class connection beyond the name? 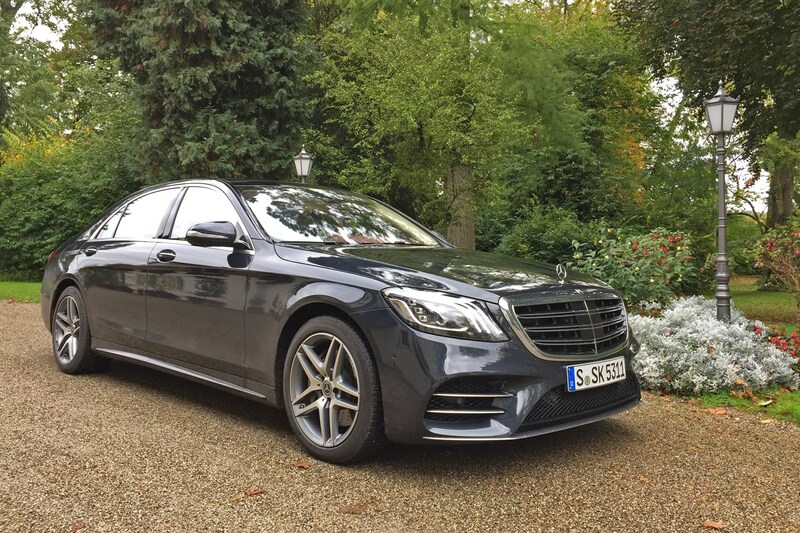 There’s a reason that the Mercedes-Benz S-Class has been seen as the default luxury car choice for the best part of five decades and that’s because it represents the very best of what the marque does. Whether it’s subjectively the best prestige saloon could be debated forever – and owners of Bentleys and Rolls-Royces would be the first to lead the counter-argument: after all, the S-Class is mass-produced. And, they’re right, by comparison it is. So let me rephrase: is the S-Class the best there is in this rarefied arena of high-end – but produced in significant number – four-door saloons? Emphatically, yes. Still, if I could take my old man out in the long-term S-Class, I can imagine his response: ‘Hmmmm. It’s nice, but it’s no Jaguar, is it?’ Indeed father, indeed. Ready for winter with a set of Pirelli Sottozeros, but where's the snow? I rarely trust weather forecasts, particularly where promises of snow are concerned. Twice in recent weeks I expected to wake up to eight inches, only to be disappointed by dawn. But, despite the lack of a white blanket across the northern Lincolnshire landscape, temperatures have plummeted with most days (and nights) of late dipping below seven degrees Celsius – perfect operating conditions for a set of winter tyres for our long-term Mercedes-Benz S 350 d.
You’ll have no doubt spotted the slinky 20-inch multi-spoke AMG alloy wheels previously fitted to our S-Class have been swapped for some chunkier 19-inch rims – they’re not as pretty, but they’re a significant step ahead aesthetically than popping on an ugly set of steel wheels for winter like you see in colder European countries. 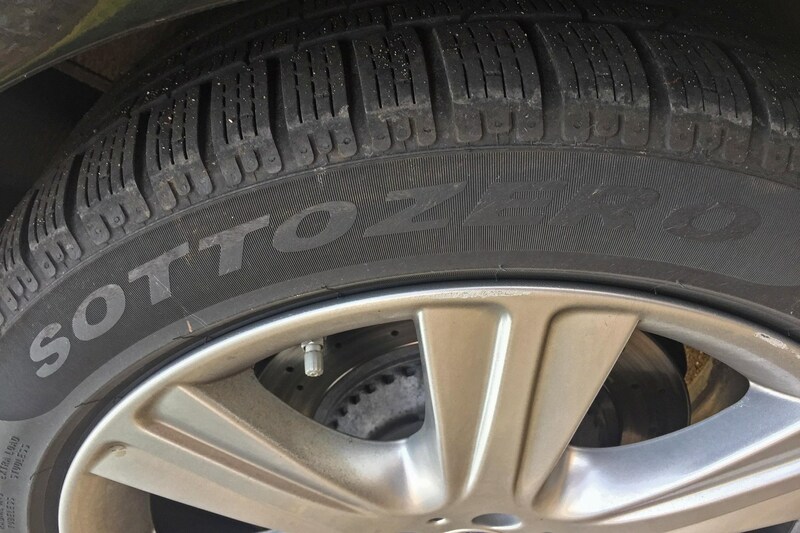 They’re shod with Pirelli Sottozeros – or ‘below zero’, but everything sounds better in Italian – complete with all the extra little grooves and cutouts in the tread pattern you expect of winter rubber. One of the reasons Britons have been slow to adopt cold weather tyres is the expense (and a lack of a legal requirement to fit them as per other European nations); these 245/45 R19s are a case in point. Surveying a few online retailers indicates you’ll be charged around £275 per corner if you fancy a matching set. Expensive, yes, but A) what's the price for safety? and B) this car was over £100,000 new, so everything’s relative. So does the S-Class ride differently? 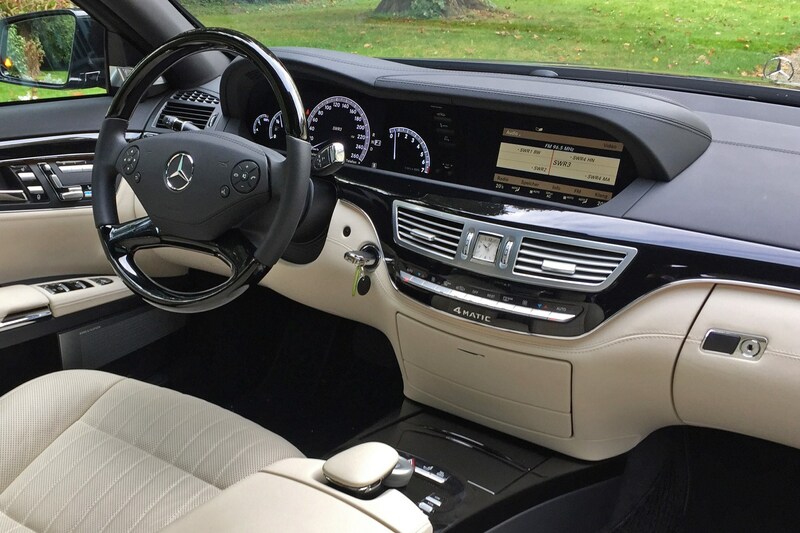 It’s difficult not to constantly laden the S-Class down with superlatives, but it’s such an effortless car to drive briskly while you and your occupants bask in sublime comfort. Few cars at any price point munch through the miles as consummately as the big Benz. Combining the swap to rims that are an inch smaller with the extra compliancy of winter tyres means that the ride quality is even better than it was before, particularly over undulating surfaces. Of course, it was impressive as it was, so this is a small, but nevertheless appreciable change. Whereas on the standard summer tyres my default suspension mode preference was Comfort, I’ve now switched the air springs to the Sport setting most of the time thanks to that increase in overall suppleness. The serenity of the ride isn’t sullied – particularly for those in the rear recliners – but being able to sense a little more of what’s going on under the car makes the passenger experience less floaty. Plying highways with a smoother surface than the table-top baize in Ronnie O’Sullivan’s games room – yes, there is some high-quality blacktop here and there – reveals a faint humming sound from the extra ridges on the tyres. It’s not especially distracting, but if you’re not making the most of that Burmester audio equipment then you’re aware it’s there. Notwithstanding the S 350 d AMG Line L’s considerable 1,955kg heft, that air suspension arrangement – particularly in Sport mode – ensures that the Mercedes is a tidy handler. Okay, despite all of the visual AMG modifications, it’s always a luxury limousine first and a sports saloon second, but roads don’t have to be poker-straight to make rapid progress. Switching to winter tyres has brought welcome extra adhesion, particularly in rainy conditions on colder days – that’s right, still no snow. Over the past few months heavy-duty farm machinery has wrecked the edges of many B-roads near where I live, meaning that after a deluge there are considerable puddles encroaching into the lanes where the asphalt has been compressed or broken. 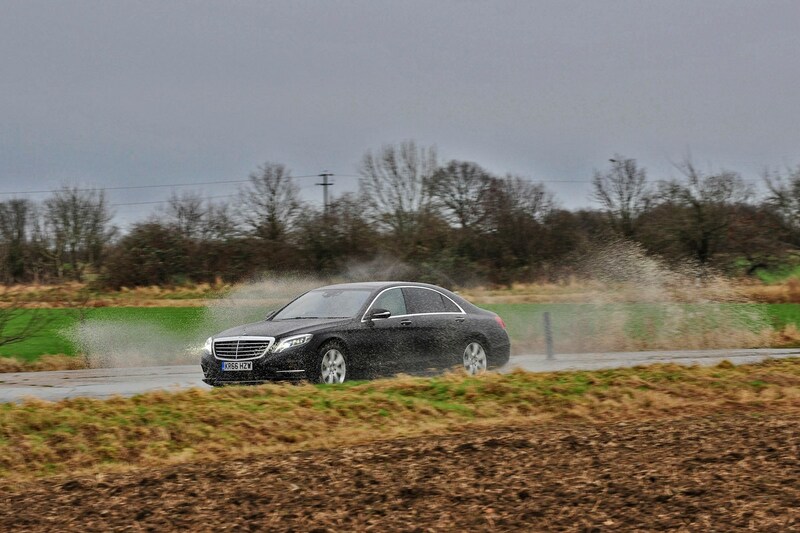 Wearing its winters the S-Class seems to plough through them maintaining grip at all times, whereas before it had them you’d feel the front end of the car lose grip on the water’s surface before biting against the tarmac again as the puddle was aquaplaned across. That additional grip pays dividends as the roads get windier – even when it doesn’t feel like you’re particularly pushing the Mercedes you’re nevertheless conscious that other drivers whose cars are on summer tyres simply can’t carry as much momentum through the bends. 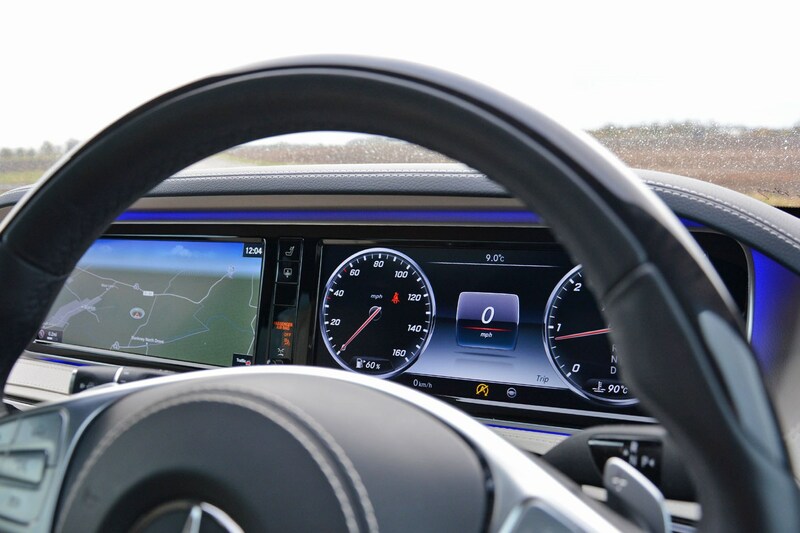 Only very occasionally on the greasiest of surfaces does the rear of the S-Class twitch as the tyres momentarily lose traction, but they soon regain it, assisted in no small part by the on-board electronic stability systems. Push closer to the limits of adhesion through a corner and you’re aware of lateral movement in the tyres, where the alloy wheel moves sideways within the rubber. Again, only a small incremental change, but a noticeable one nonetheless. So far, so good then. It’ll be interesting to see over the coming months whether the Mercedes develops more of a thirst for diesel thanks to the change in rubber. It’s been slowly rising up to 34.6mpg, so I’m not relishing the prospect of a dip. ‘Oooh! You could buy a house for that!’ is the familiar response from Lincolnshire-based people who haven’t kept tabs on car prices whenever they ask how much our Mercedes-Benz S-Class long-termer cost. Of course, it’s not a new car, having been registered in November 2016, but when it was showroom fresh, it had an asking price of a not inconsiderable £73,580. Consider further that our S 350 d AMG Line L Saloon has had its already generous level of standard specification bolstered further with options to the tune of £34,755. Just let that sink in a moment: almost £35,000 on extras. That sort of money will buy you a whole premium-badged car… More on that later. Let’s build up some tension here and explore the S-Class’s extras from the least expensive up to the dearest. Air-Balance package: £360 – Disclaimer: I have virtually no sense of smell, so this one is completely lost on me. However, whenever I alert passengers who aren’t hard of scenting to the perfumed bouquet in the air, the feedback has tended to be one of apathy. Verdict: save your money. 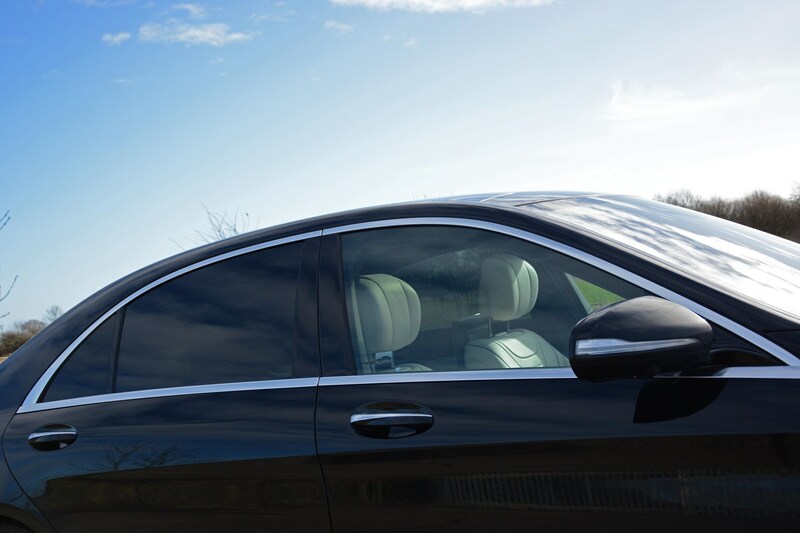 Privacy glass: £400 – On a car at this end of the market, that’s primarily designed for chauffeuring, having to pay extra for darkened rear glass feels mean. Verdict: go for it. Front Seat Memory package: £500 – Another ‘why isn’t this standard?’ question. In addition to a four-way lumbar adjustment for the front passenger seat, both front chairs have extra padding on the head restraints as well as a memory function for the electrically adjustable steering column and mirrors. Verdict: an appealing convenience if different drivers share the S-Class. Warmth Comfort package: £530 – Heated front seats aren’t common enough, while similarly warmed rear pews remain a rarity – so the notion of heated armrests (doors and centre console) is a surprise and delight sensory joy. 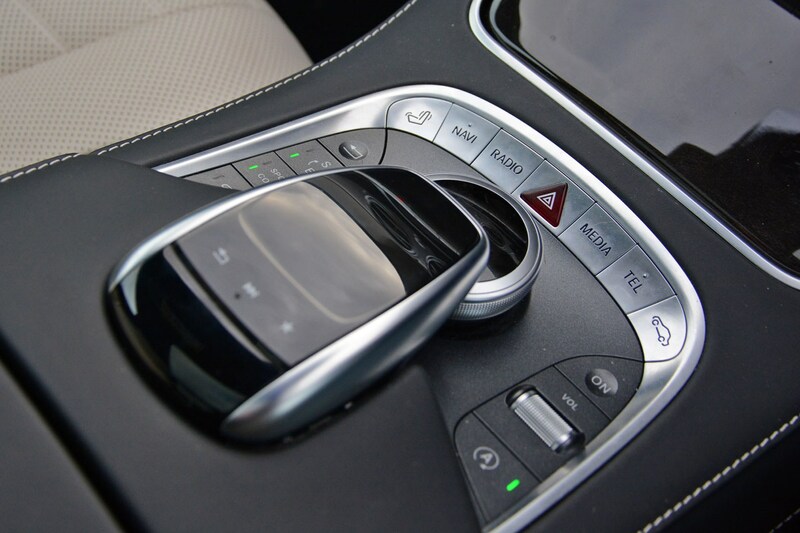 Naturally, a heated steering wheel is part of the package, a bonus seeing as it’s partly trimmed in wood. Verdict: we’ll forgive you for convincing yourself you need this in your life. 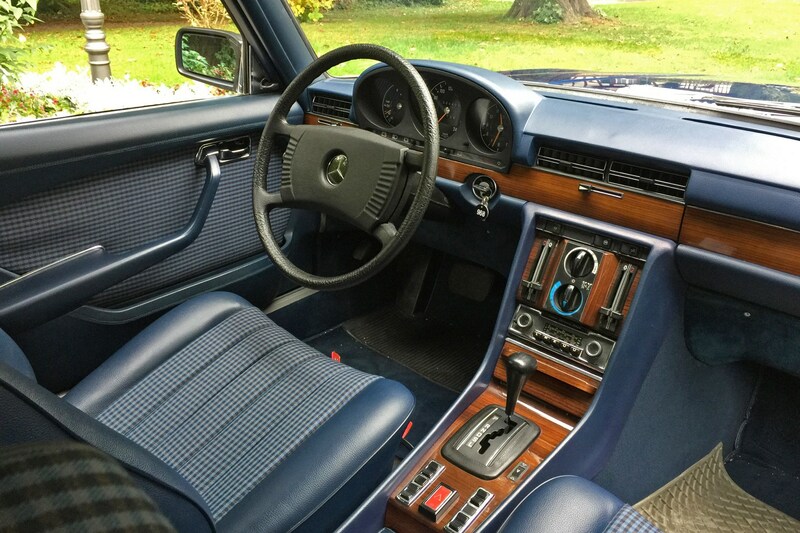 Three-spoke wood-and-nappa leather-trimmed AMG sports steering wheel: £630 – Confession time. I’ve never been a fan of whole- or part-wooden steering wheels. They feel too shiny with little-to-no-give in them for my taste, and the S-Class’s one’s the same. A full-leather item would be my choice here. 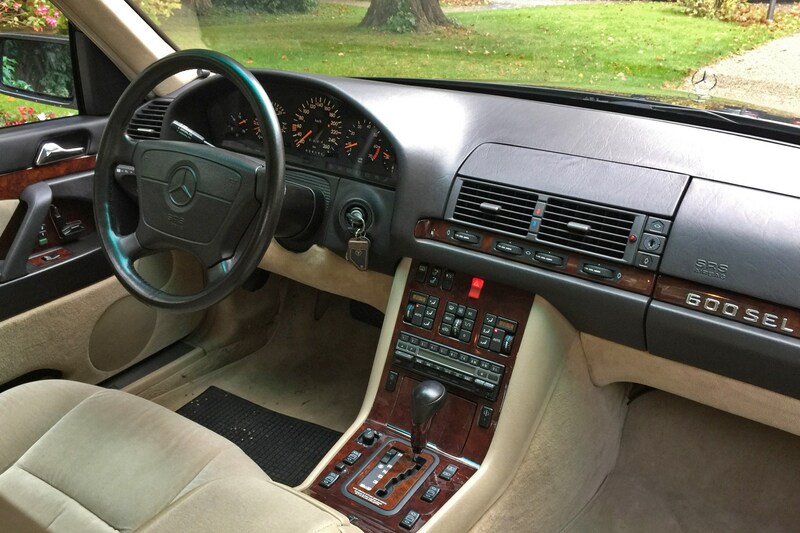 Still, the buttons on the wheel are placed conveniently, and being a slightly older Mercedes, it still has the cruise control wand on the steering column. Verdict: not our favourite tiller. Comfort-ventilated front seats: £660 – These seats are beautiful. So cosseting and warm in winter, yet leaving you fresh and zingy in the warmer months as climate-controlled air softly breezes through the perforations in the leather. Verdict: a must-have. 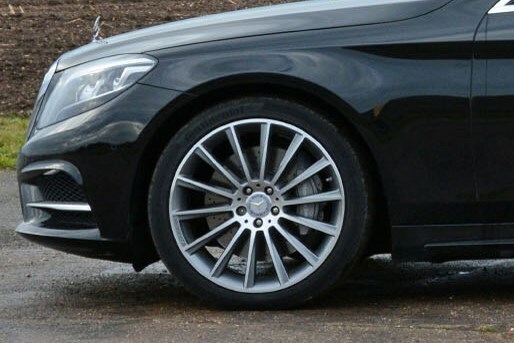 20-inch AMG alloy wheels: £780 – Despite being big rims, these didn’t spoil the supple ride from the air suspension system. However, they disappeared and were replaced by chunkier 19-inchers when we switched to winter tyres. 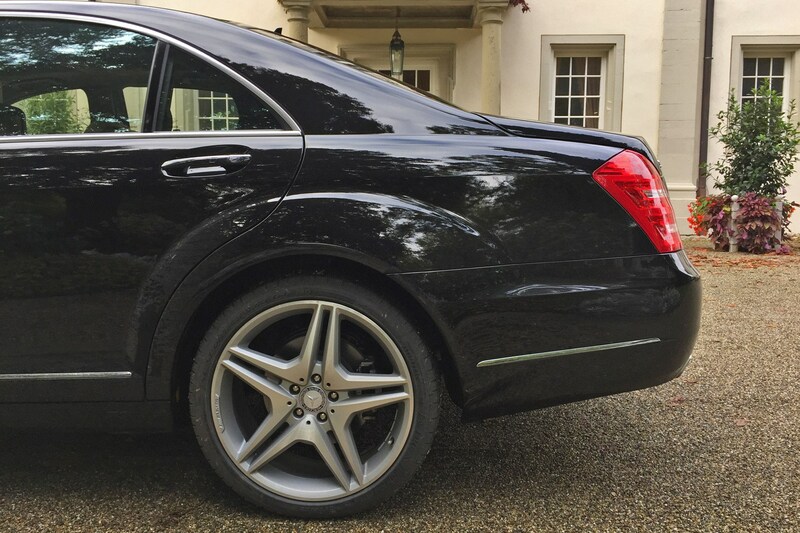 Sporty yet sophisticated, these are the wheels of choice for the big Benz. Verdict: do it! 360-degree camera: £880 – While this isn’t essential, it’s nevertheless desirable on such a large car. There’s one camera under the number-plate plinth, one under each door mirror and – amusingly – the front one lives behind a blanked-off panel at the top of the grille. It’s useful, but the birdseye-view of the car is slightly skewed, occasionally making it tricky to get it square into a space. 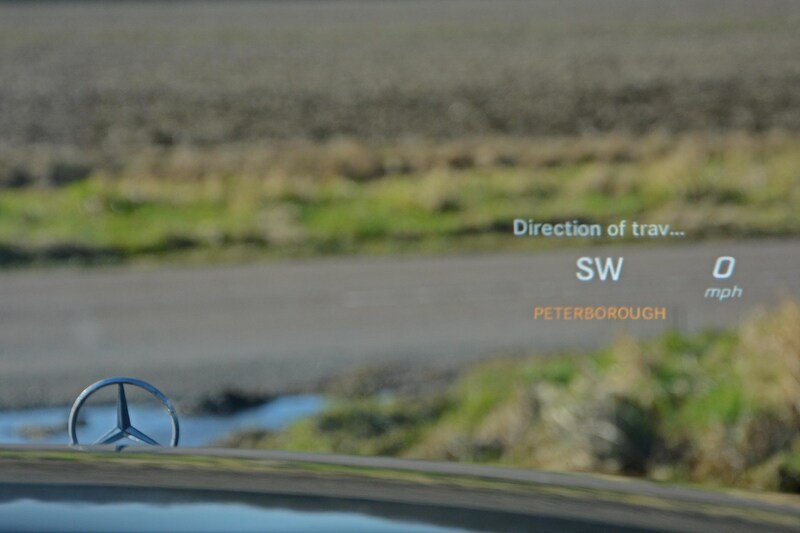 The camera system on our previous V-Class long-termer was superior – and clearer. Verdict: expensive, but more of benefit than a hindrance. 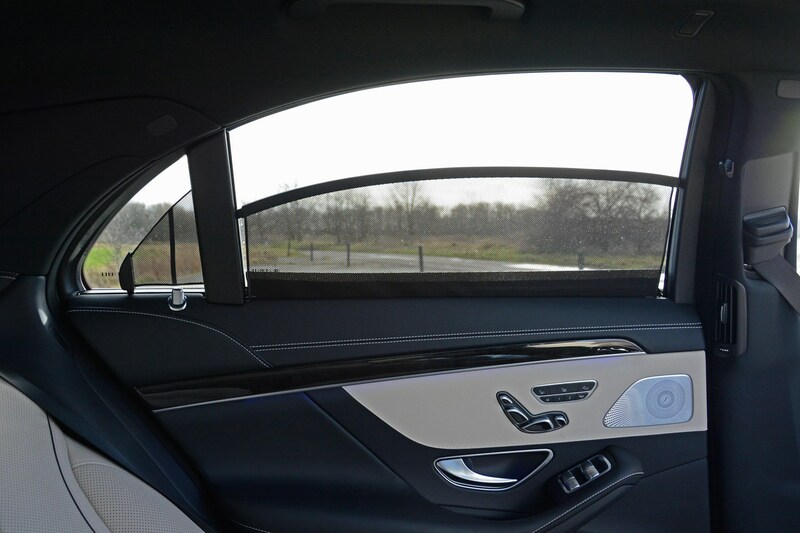 Roller Blind package: £1,010 – So far, anyone I’ve transported in the back of the S-Class has preferred to have the blinds in the rear doors lowered, even on the occasional days with bright, low-level winter sunshine. From a driving perspective, I find the rear-screen one restricts the view out too much. Verdict: would be more convincing at half the price, so spec the rear privacy glass instead. Refrigerated compartment behind rear armrest: £1,130 – Exactly what it says on the tin. Whether you need it to chill Champagne is down to the tastes of your rear-seat passengers, but it works equally well cooling bottles of water and egg sarnies for a long trip. Be conscious that the fridge’s back end really eats into boot space, though… Verdict: an extravagance, but one chauffeured passengers will expect. Head-up display: £1,230 – Another safety feature that sounds superfluous until you try it, when it suddenly becomes indispensable. 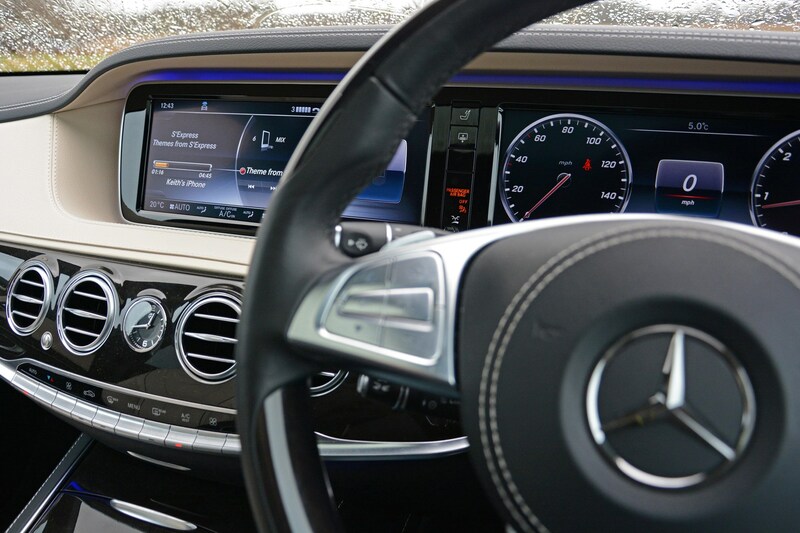 The system fitted to Parkers’ long-term S-Class has since been superseded by an even more sophisticated package, but ours remains clear and informative, despite the shonky camerawork. Verdict: a tad pricey, but worth it. 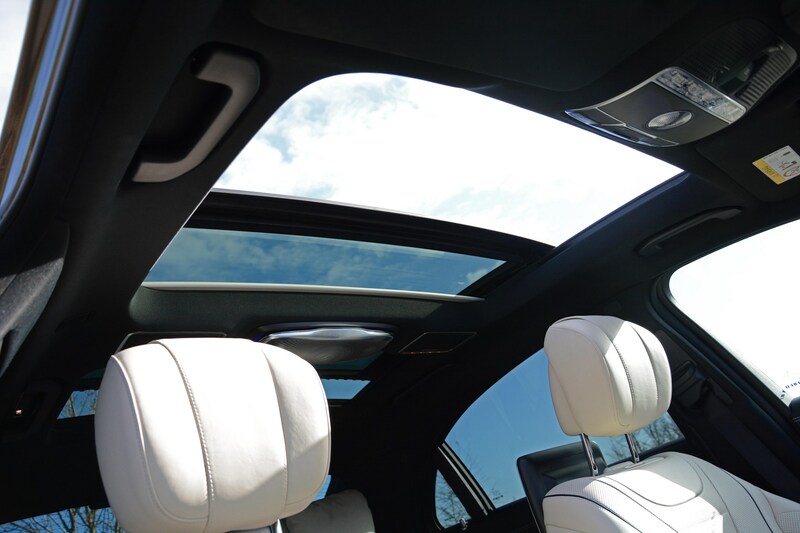 Electric panoramic glass sunroof: £1,430 – There’s inevitably a rush of wind noise around a sunroof opening when it’s been retracted, but in the S-Class it’s relatively subdued until you venture into three-figure speed territory as I discovered on an autobahn run in Germany. 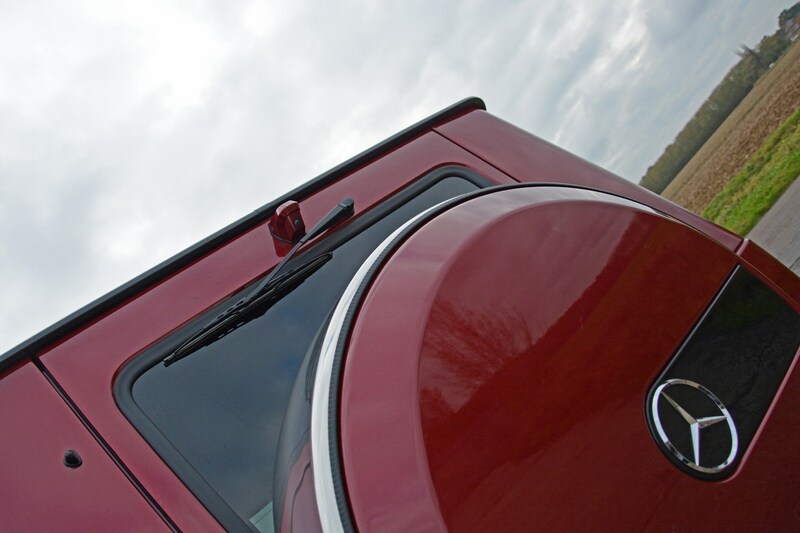 The glazed roof is in two halves, with both the front and rear section having an electric blind. Verdict: great for making the cabin feel airy, but we’ve barely had the roof open. 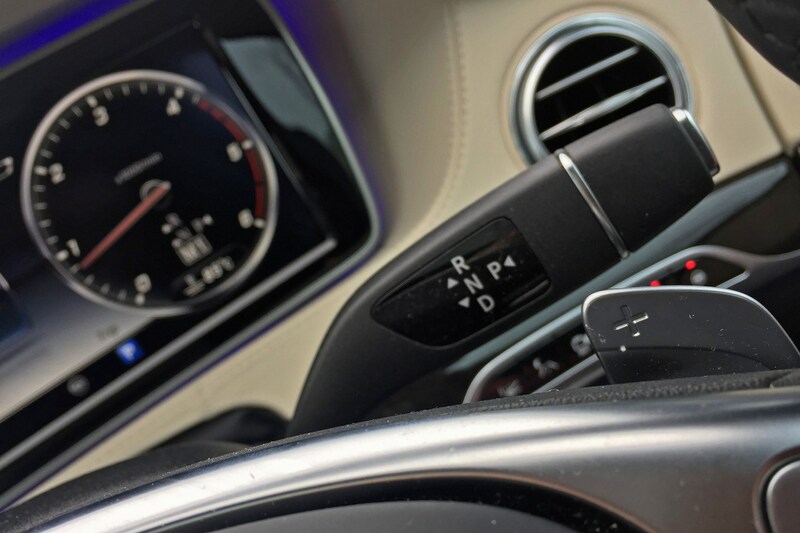 Keyless-Go Comfort package: £1,490 – Somewhat bafflingly given the basic price of the car, this isn’t standard, but it’s a convenient package that’s worth upgrading to, despite its apparent expense. Not only can the car be unlocked, started, stopped and re-locked without using the physical key, the exterior door handles are illuminated for ease of use in poorly lit areas, and the boot can be opened and closed by wiggling your foot under the rear bumper. Verdict: curiously expensive, but so convenient you’ll regret not speccing it. 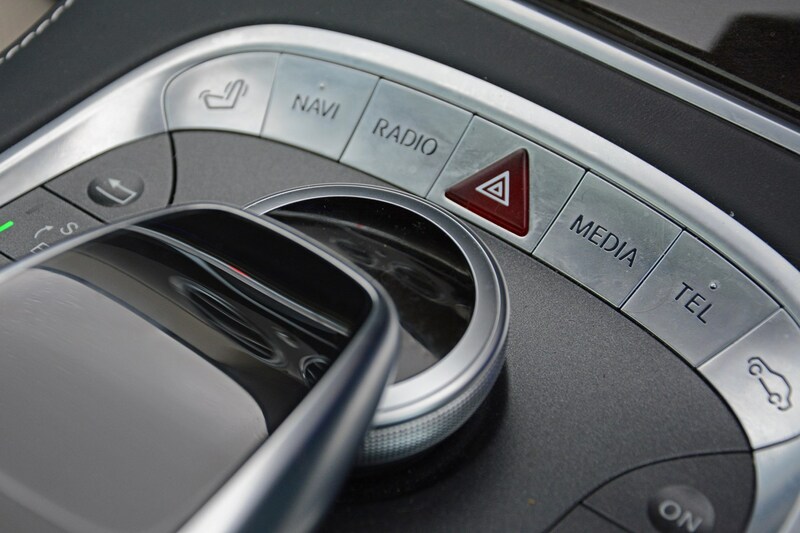 Driving Assistance package: £1,695 – Once again falling into the ‘this is optional?’ category is this bundle of safety features, such as blindspot warning, lane-keeping assistant and Mercedes’ adaptive cruise control – Distronic Plus – with steering assist. It all works faultlessly, especially the adaptive cruise which is one of the most natural-feeling of any car on sale. Verdict: keep yourself and your passengers even safer with this. Front Seat Comfort package: £1,740 – A euphemism for the S 350 d’s dynamic, massaging seats – and not something I can get on with. Turn the system on and the seats inflate at the sides to keep you in position through twisty bends; the massaging function inflates bags at varying intervals up your back and under your cheeks. Most passengers love the experience, but I find it too distracting to use. Verdict: a definite try before you buy. 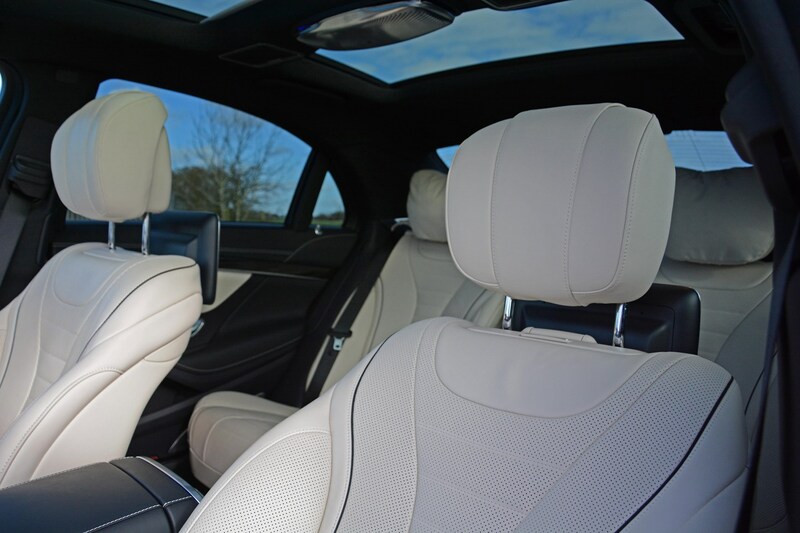 Nappa leather upholstery: £1,740 – Leather is, as you’d expect, standard fit on a car of the S-Class’s calibre, but the upgrade here is to softer nappa hide in two-tone porcelain and black. The feel of it is delicious, but the colour scheme isn’t to my taste, not that that’s of any consequence. More leather on the dashboard and door panels would make it feel even more special. Verdict: so sumptuous; choose colours wisely, mind. 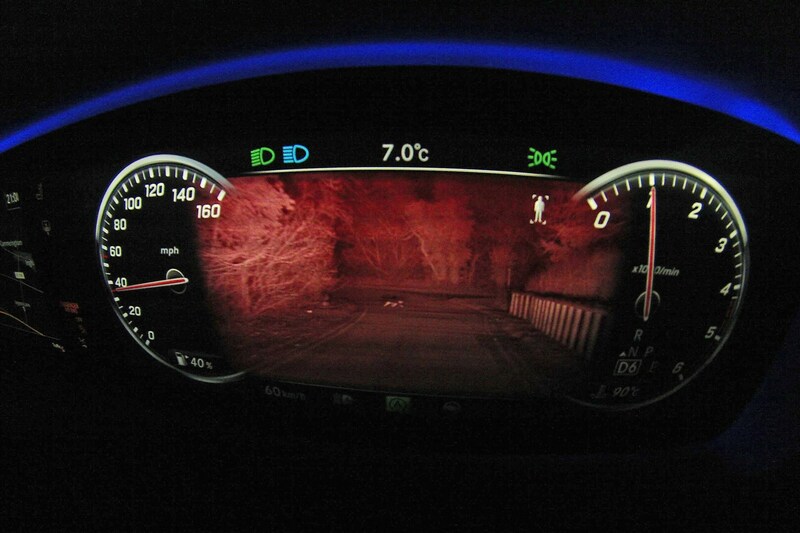 Night View Assist Plus: £2,080 – This safety aid is such a clever piece of technology that we’re going to have a specific update just for it – suffice to say that for night-time driving, it’s an impressive piece of kit. Verdict: worth every penny. Individual Rear Seats package: £5,000 – This is such an expansive package that we’re going to treat it to its own future update, but essentially the bundle consists of two individually reclining rear seats, with electric controls, heating, cooling, massaging and screens built into the front seat-backs. The left-side rear seat reclines to 43.5 degrees (up from 37 degrees) for an even more relaxing experience – there’s even a legrest! Also included in this grouping is the Rear Seat Comfort package (£3,500), the Rear Seat Reclining package (£1,500) and Thermotronic luxury automatic rear climate control (£1,170). 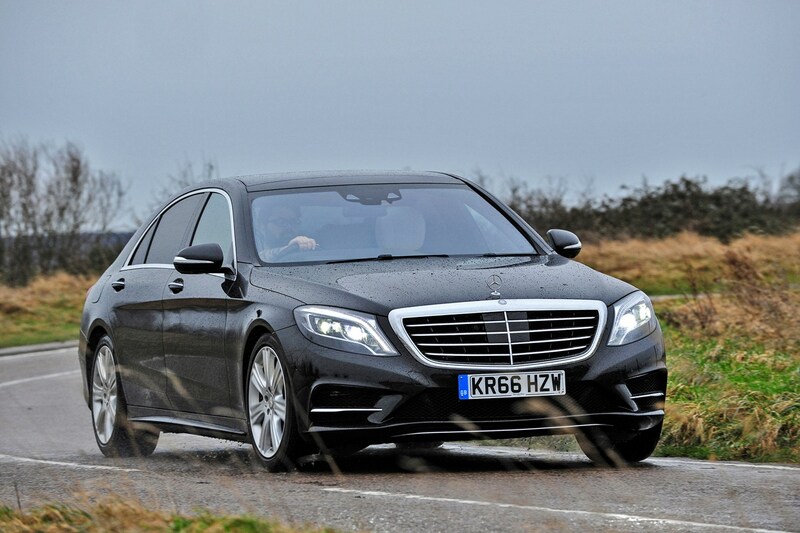 Verdict: if you’re buying an S-Class to be driven in, then this is worth the hefty outlay. Burmester high-end 3D surround sound system: £5,300 – You don’t have to be an audiophile to appreciate the sheer magnificence of this 24-speaker, 1,540-Watt upgrade. Keep your eyes peeled for a specific future update on this incredible package. Verdict: an emphatic ‘yes’. So, what of that premium car alternative? 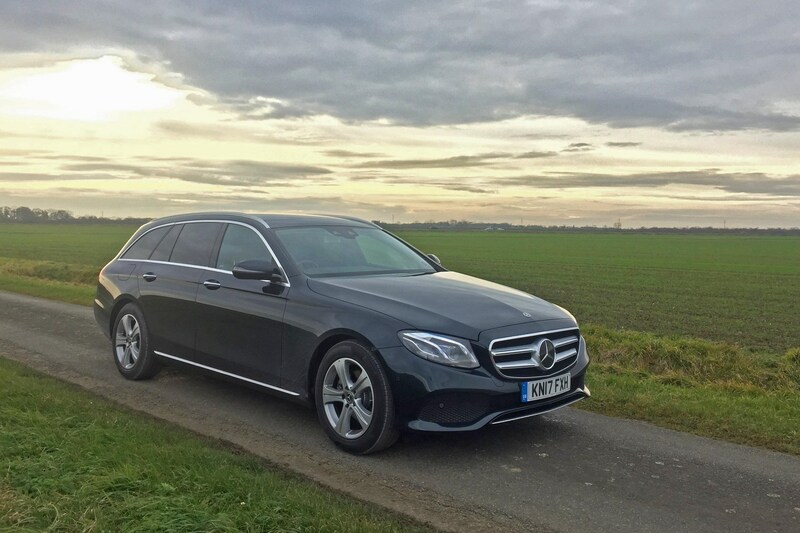 Not just an impressively capacious wagon, the Mercedes-Benz E-Class Estate – seen here in E 220 d SE guise – is an economical-yet-premium choice. If you’re looking for a large, comfortable car that won’t break the bank to buy or run, then the E-Class is very hard to argue against. For many people, it will be the most luxurious car they ever buy, and to that end it meets the brief of making its owner feel special. And yet, this 17-plate example – with some choice options such as metallic paint, the 12.3-inch widescreen information display and the Premium Plus pack – will set you back £34,000 from a franchised Mercedes-Benz dealer, with a nominal 10,000 miles of use under its wheels. 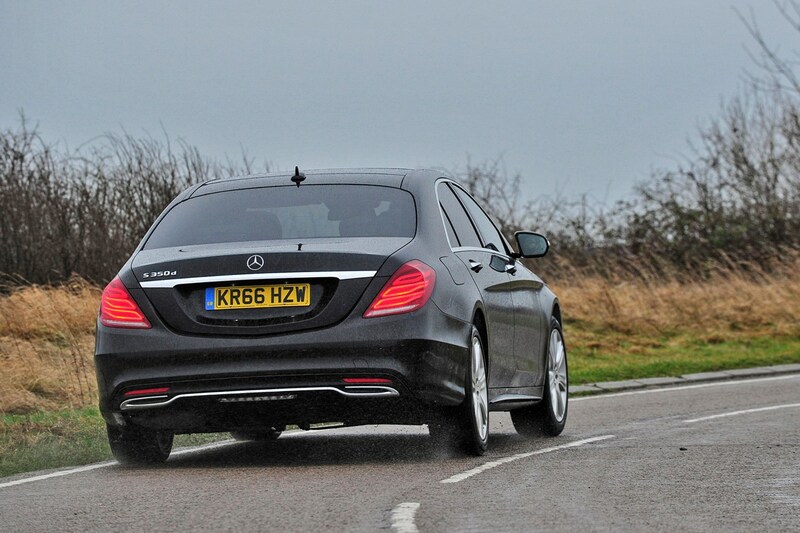 A whole, sub-one-year-old E-Class Estate or the S-Class’s plethora of options? Life, of course, isn’t as simple as that. 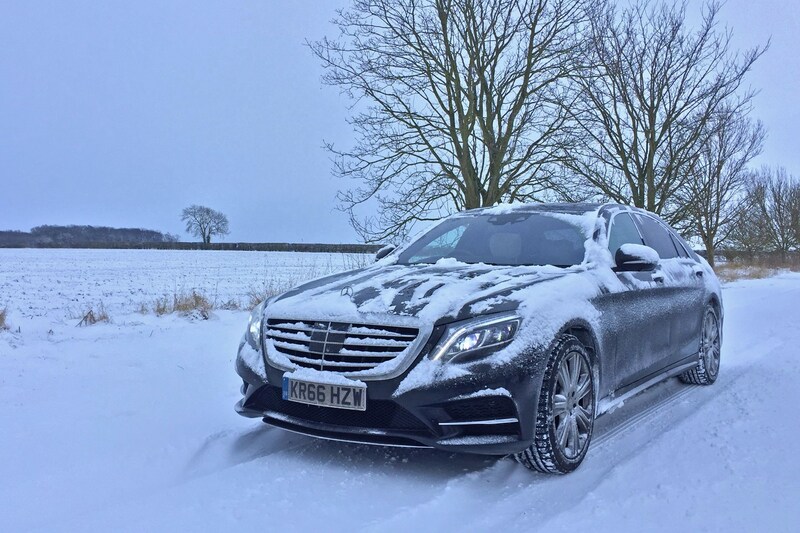 Will winter tyres help our Mercedes-Benz S-Class beat the snow? It’s not every day that I get flagged down by an elderly gentleman walking a husky while I’m driving Parkers’ long-term Mercedes-Benz S-Class, but I came to a halt and lowered the window out of politeness. 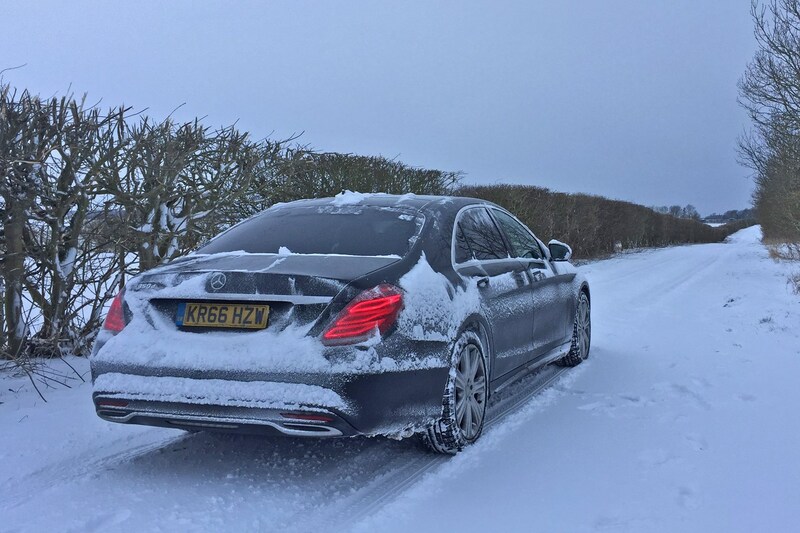 To add context, I should make clear that his inquiry was laced with surprise because the S 350 d was making light work of around six inches of snow, courtesy of the Pirelli Sottozero tyres I covered a couple of updates ago. ‘Winter tyres,’ I responded, pointing down towards the front wheel. Satisfied that there wasn’t some sort of wintery sorcery going on, he carried on his way, making it no more than 10 metres before his dog him over and dragged him along for a short distance further. ‘I’m alright, I’m alright,’ he hollered as he righted himself and dusted the snow from his sheepskin coat. 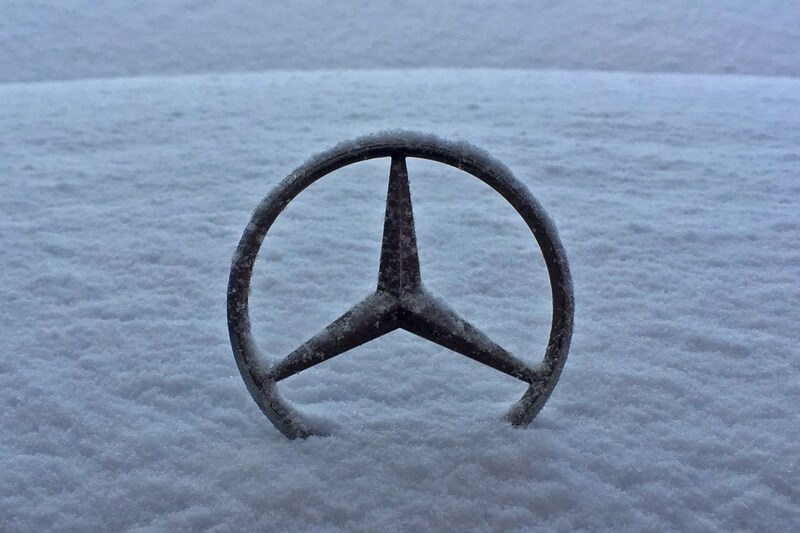 Naturally, before I went out on my snowy journey, it was vital to get the Mercedes in a suitable state for the road. Reminiscent of the generous frosting on a Krispy Kreme doughnut, snowcapped as the S-Class was as much of the deluge as possible had to be removed before I headed out. Roof, bonnet (apart from the snow that was frozen to the bodywork), windows, lights and number plates all had to be cleared. 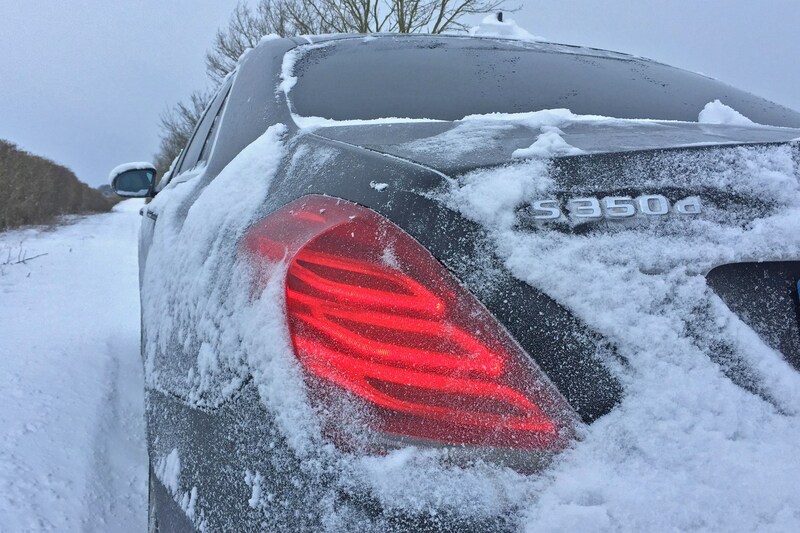 A neighbour appeared to removed what the Beast from the East had deposited overnight from his car, too, and I noticed him casting his eyes over the S 350 d: ‘4Matic?’ he yelled. ‘Nope – Pirelli winter rubber,’ I responded. Well, it seems you can, because within minutes of leaving he was gingerly making his way back onto his driveway having travelled less than half a mile, as I exited mine without the merest of difficulties. Lights turned on (manually, not on their automatic setting), with both the seat and steering wheel heating ramped up, I was off. Initially I left the automatic gearbox to its own devices, which didn’t faze it was I made progress along the single-lane roads, leaving tyre tracks in the virgin snow. Gradually I built the speed up to 30mph without even a momentary flicker of the traction control light. Very impressive. Inevitably, it wasn’t long before I caught up another car, seemingly struggling for traction – and the ability to maintain a straight line – at 12mph. Conscious that I didn’t want to call upon the brakes and risk inducing a skid, I took manual control of the gearbox using the paddles behind the steering wheel. Pulling down a couple of ratios to first ensured a progressive, manageable retardation of speed until I was safely able to overtake. Even with such slippery under-wheel conditions, how well the S 350 d corners in the show underlines just how effective those Pirelli tyres are, despite all of the engine’s power being delivered exclusively to the back wheels. Again, without a hint of forward traction being broken, or any suggestion that the tail of the car was going to slide wide, safe, steady progress was maintained. 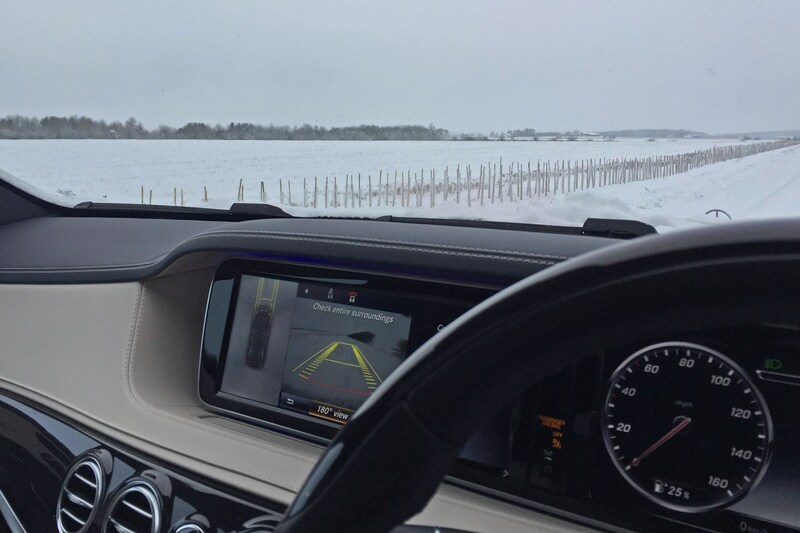 While this morning’s drive could hardly be described as a scientific test, it at the very least adds to the debate about whether many new car buyers actually need four-wheel drive, particularly if the tyres fitted aren’t optimised to work in low temperatures and slippery conditions. Don’t forget, there’s a reason winter tyres are a legal requirement in many European countries, whereas four-wheel drive isn’t. Buoyed by my progress and satisfied that the old guy’s husky wasn’t dragging him along like a sleigh, I decided to plough on – not literally – and head to the office. Nothing was going to stop me. Aah well, even though years have passed since I gave up teaching, I still get the odd snow day. 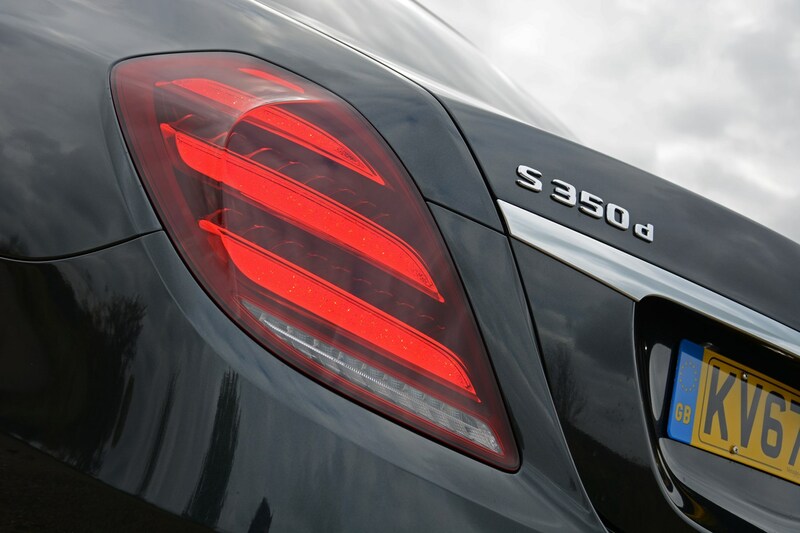 How does the Mercedes-Benz S-Class's night vision system work? 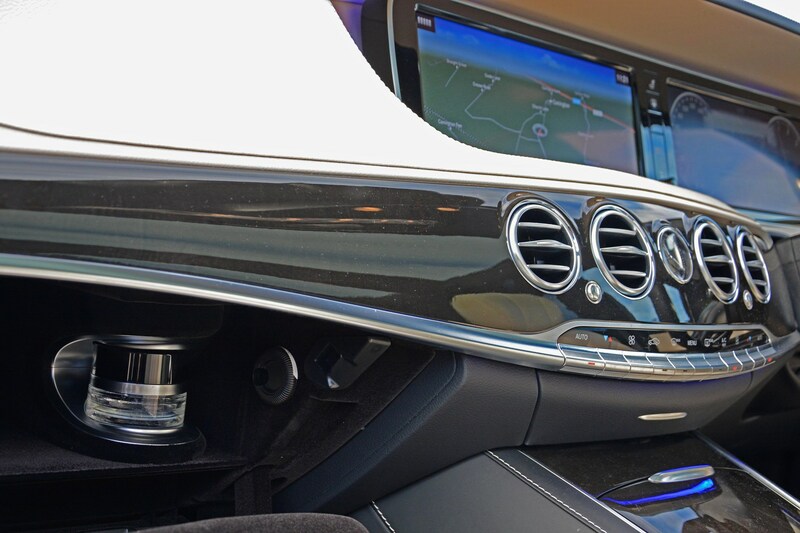 There’s something very James Bond about our long-term Mercedes-Benz S-Class’s Night View Assist Plus package. As a device that allows the driver to be proactive in taking avoiding action to navigate around pedestrians, large animals and other obstacles that might be impeding one's path, it’s a fully blown how-did-I-manage-without-this showpiece. For passengers, it’s simply very cool. Actually, it’s cool for drivers too, so a double-win. Where is the Night View Assist Plus equipment located? In a former career – before the teaching one I oft-bore readers with – high-end night-vision kit was something I was well-versed in, but even with hand-held scopes, the hardware was cumbersome and eye-wateringly expensive. 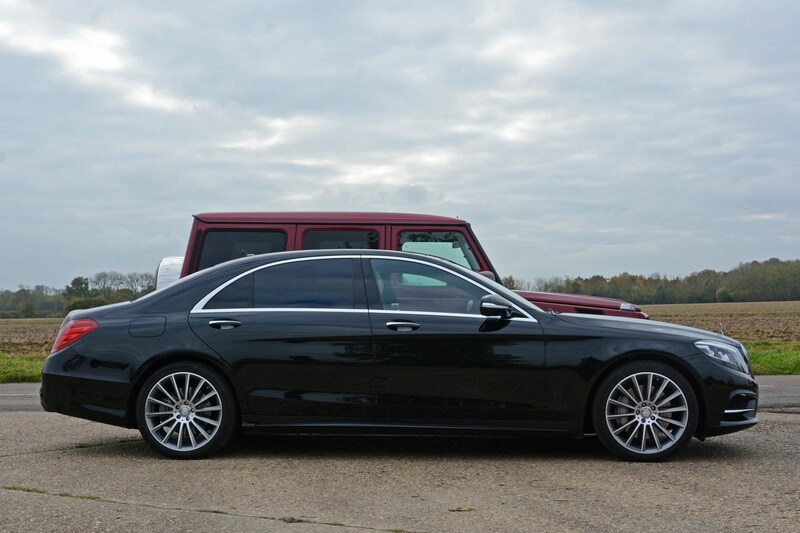 Here in the S-Class it’s an extra-cost option that would have set a customer back £2,080 when our S 350 d was new, so still not exactly a pittance, but of the plethora of safety kit fitted to our Benz, it remains the one I champion the most. It’s also incredibly neatly integrated, with a small camera – you can just make out the green spot of its lens towards the bottom-right of the paraphernalia around the rear-view mirror – mounted at the top of the windscreen, while its display appears between the speedo and rev-counter as and when required. 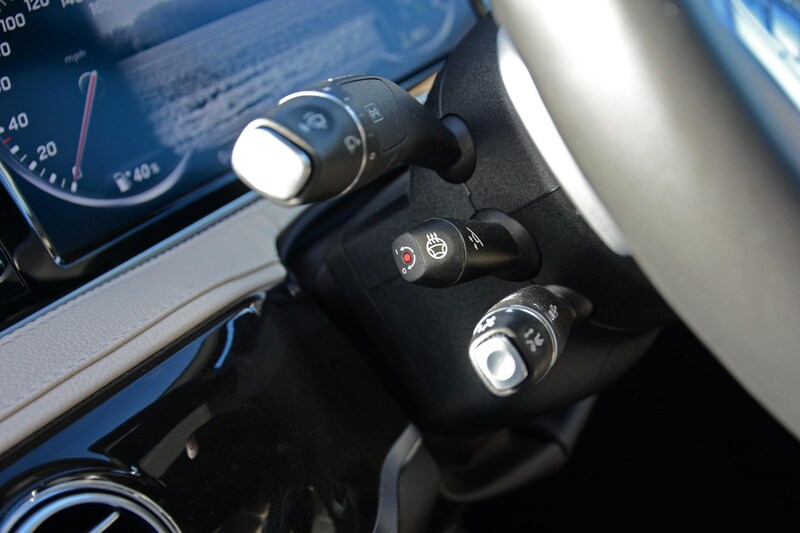 To activate it, simply press a button located on the dash to the right of the steering wheel. Simply put, it’s proved to be so good that I don’t drive the S-Class at night without it switched on. How does Night View Assist Plus work? 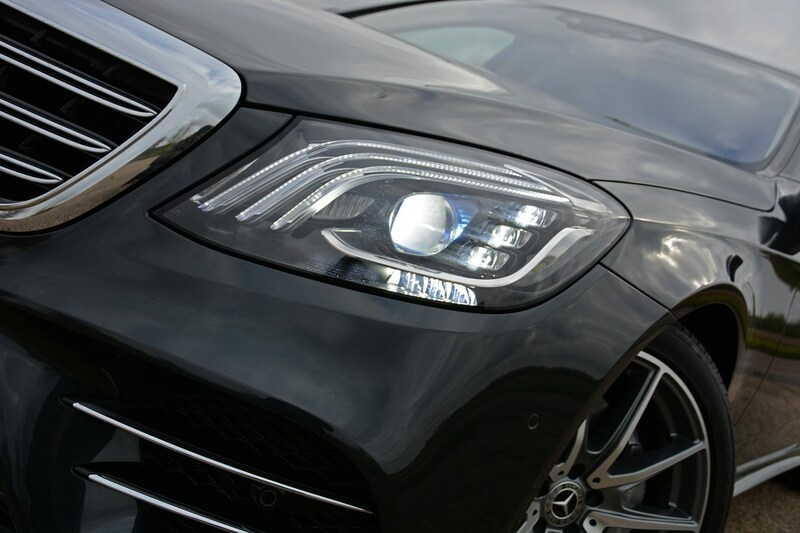 As superb as our S 350 d’s LED headlamps are, they are constrained by both their luminescence and the breadth of the light pattern emitted. Yes, they could be brighter, but you’d immediately become a nuisance to other road users and pedestrians, so that’s not going to happen. Infra-red light works differently, primarily because it’s invisible to humans and therefore can be shone brightly without dazzling oncoming drivers or anyone on foot. 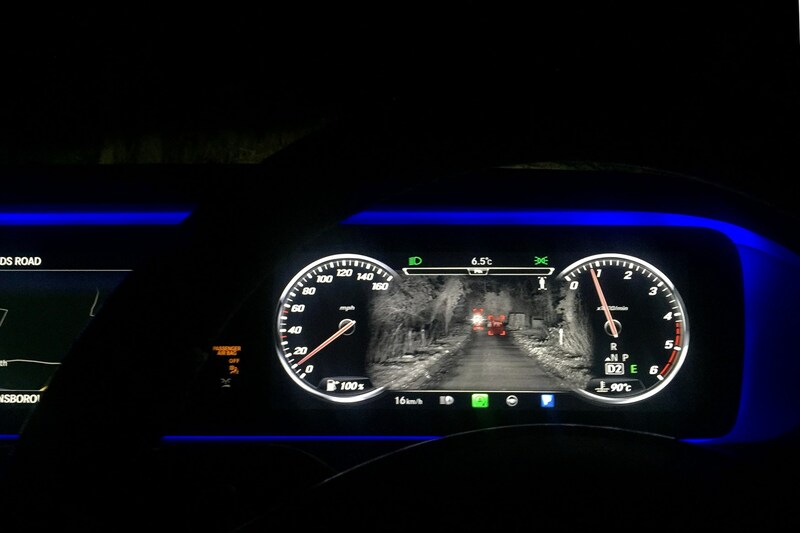 Beams of infra-red light are sent out from the front of the S-Class, with the special camera picking up what the driver’s eyes can’t see from the headlamps alone, even when on high beam. 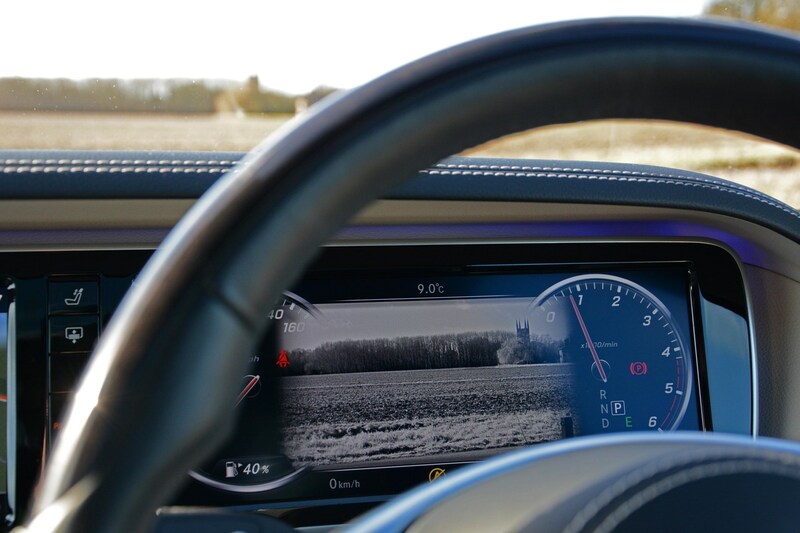 What appears on the screen immediately below the driver’s eyeline is a facsimile of what can be seen through the windscreen, albeit much brighter enabling a deeper, wider field of vision. It’s no exaggeration to say that in artificially lit urban areas, the image displayed on screen almost looks like daylight, albeit in black and white. Does Night View Assist Plus do anything else? Making the night-time environment brighter is one thing, but Mercedes’ system goes further by pinpointing potential dangers and obstacles before the driver reaches them. It’s been programmed to recognise human shapes either walking or as cyclists, together with the side profiles of larger animals. 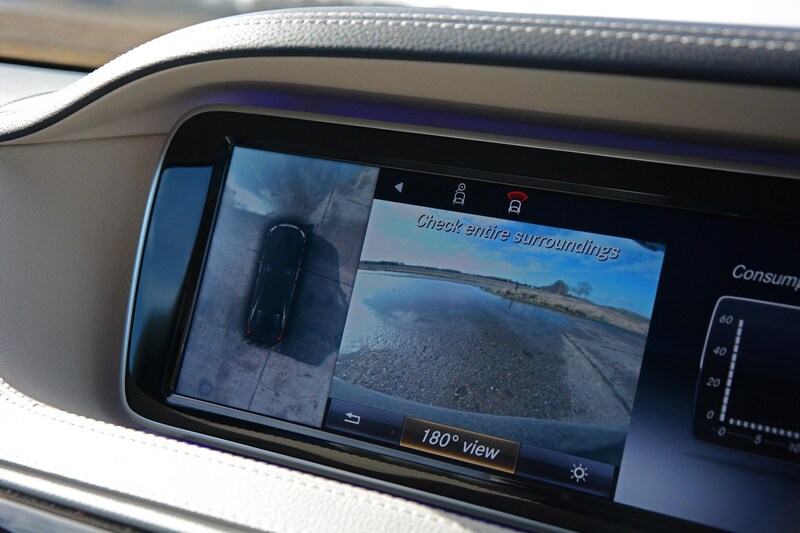 In the majority of instances – and even in the rain, as illustrated in the videos – as soon as the S-Class’s software recognises one of its known silhouettes, it highlights it on-screen by overlaying a translucent red box across it. For as long as the whole shape is visible and it’s view is not blocked by objects such as parked cars or street furniture like railings, bollards and so forth, the object is tracked, with the red box in screen getting larger as the driver gets closer, and is able to see it in their normal field of vision. Venture out into the sticks on a typical unlit B-road and the system adds a couple of party pieces. As soon as the camera picks up on one of its known shapes, it again overlays the red box around it on screen, but it goes further to alert both the driver – and what the car has ‘seen’ – in order to avoid potential danger. For the driver, the whole display areas repeatedly flashes red to properly get your attention in case you’d not seen the initial highlight. Outside, the pedestrian – or large animal – is warned of the oncoming car (assuming they cannot see the headlights or hear the engine and other noises associated with it being driven) by what Mercedes refers to as the Spotlight Function. At the same time as the screen blinks red, a small section of high-beam light from the headlamps is flashed directly at the object the camera has picked up on; if it’s a pedestrian, the usual reaction is to cover their eyes and flail their arms in a perplexed manner – animals invariably do nothing other than run. Overall, the effect is the same, allowing the driver to make a decision about whether they need to slow down and alter their trajectory to avoid the obstacle. Forewarned is forearmed and all that. 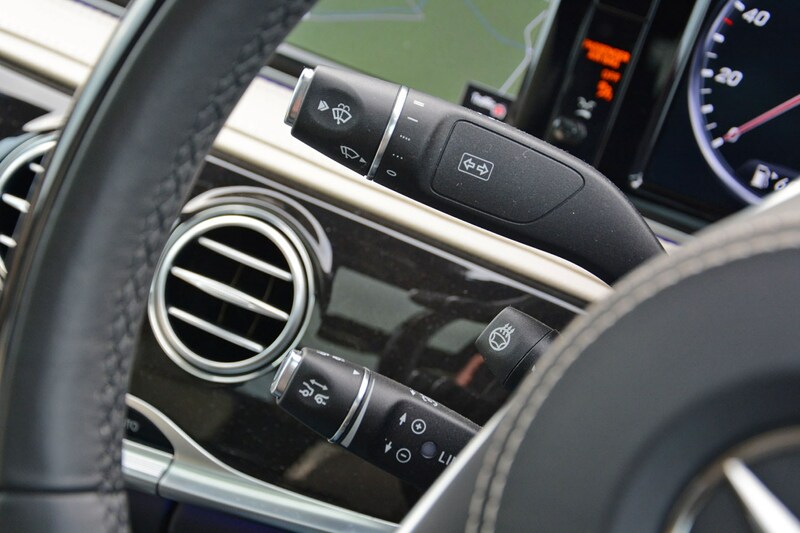 And, of course, should you fail the heed the warnings given, the S-Class’s automatic emergency braking will cut in to prevent – or minimise the severity of – any impact with the obstacle. What large animals does Night View Assist Plus ‘see’? Based on my personal experience over the past few months, a variety of animals are highlighted by the night vision system that you wouldn’t exactly call large, whereas others that ought to qualify are seemingly ignored. If the system picks up on a person walking a large dog, only the former is highlighted, unless the canine is some distance from its owner and can be seen in side profile. Similarly, cats and hares are usually ignored, unless they stand upright, before scarpering out of view. Of nature’s remaining wildlife that tends to frequent my corner of Lincolnshire, hopping rabbits, strutting pheasants and flying owls have yet to be highlighted by the system, but deer always are. So, is Night View Assist Plus worth spending a tad over two grand on? There’s no doubting that it’s an expensive option in isolation, but given we’re talking about this being a luxury saloon already costing the thick end of £90,000, it will be small change for most S-Class buyers. Undoubtedly money well spent. 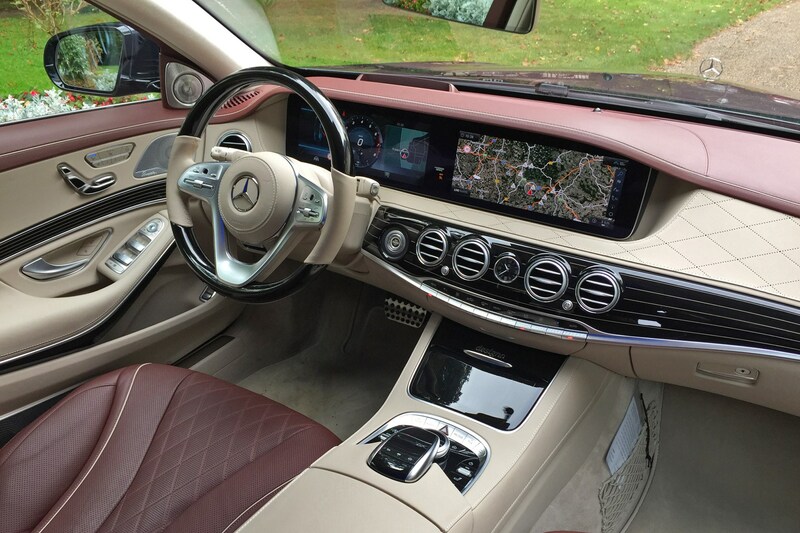 One area of many in which the Mercedes-Benz S-Class excels is as a luxury car in which to be chauffeured in, particularly as our S 350 d AMG Line L features an array of optional extras to make being driven about a truly cosseting experience. 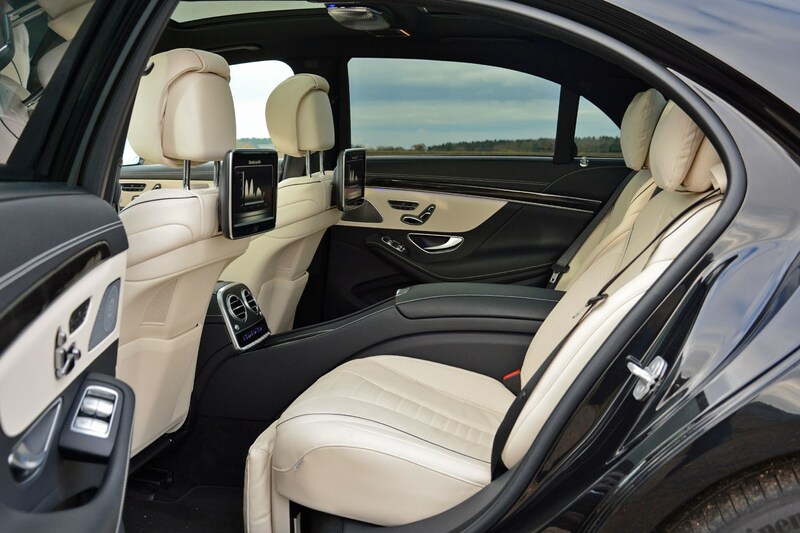 Individual Rear Seats package (£5,000) – electrically reclining twin seats (no centre one for a fifth passenger), with heating and ventilation functions, temperature-controlled cupholders, additional cushions for the headrests and fold-out tables. 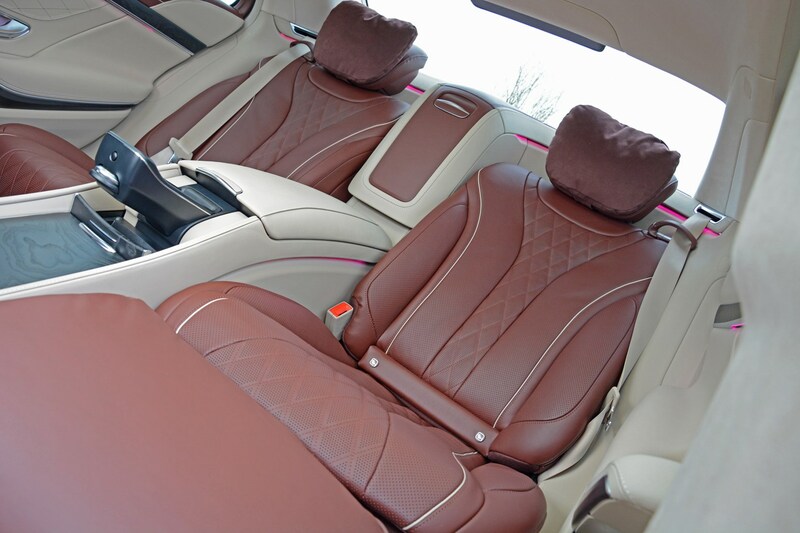 Rear Seat Comfort package (£3,500) – in-built massage function for the rear seats and display screens mounted on the back of the front seats. Rear Seat Reclining package (£1,500) – additional reclining for the nearside rear passenger seat (up to 43.5 degrees from 37 degrees) including a leg rest, extended travel for the front passenger seat to move it further out of the way and a front headrest that drops to improve the forward-view of the passenger behind. 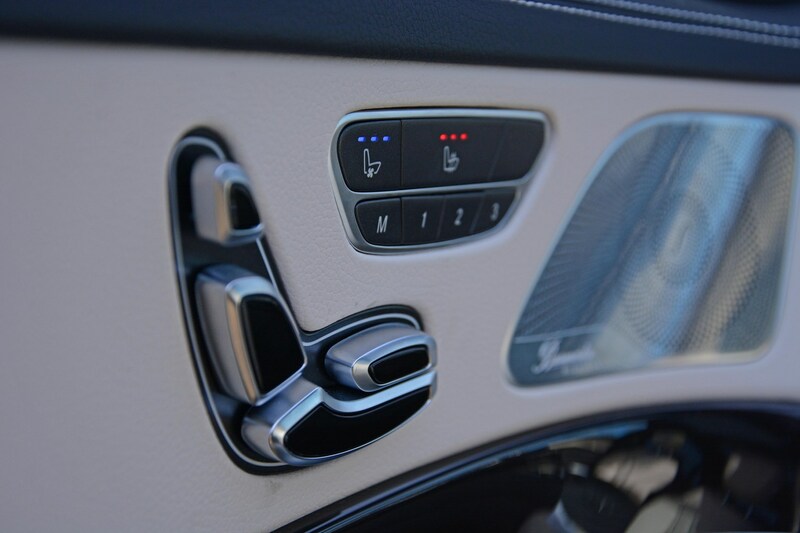 Thermotronic luxury automatic climate control for the rear (£1,500) – separate climate controls for those in the back, with vents integrated into the centre console and into the central pillars where the doors are hinged. Refrigerated compartment behind rear armrest (£1,130) – with space for a couple of bottles of champagne. That little lot weighs in at a not inconsiderable £12,630 – all for the benefit of the pair of passengers in the rear. It all sounds fabulous, but if this isn’t something you’re accustomed to, is it? To find out I asked/persuaded/badgered (delete as applicable) four volunteers from Parkers’ publishing group, Bauer, to see how they enjoyed being chauffeured around. 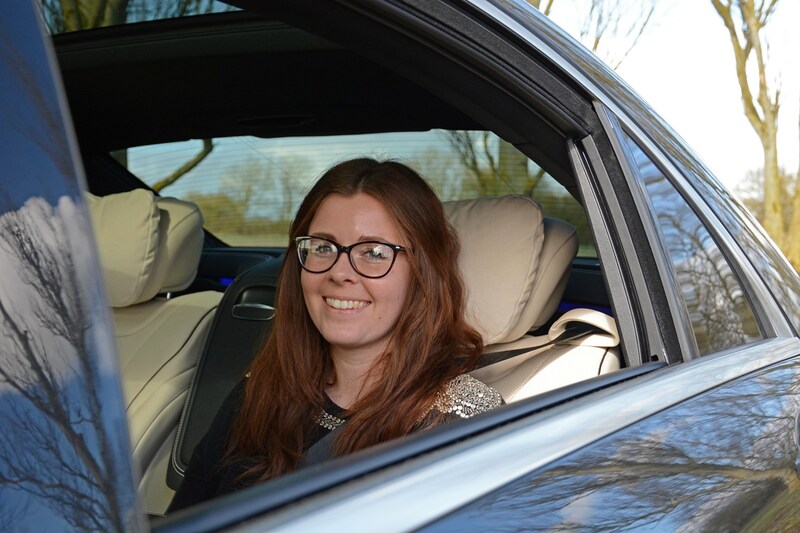 ‘The stand-out feature for me were the seats: they are just amazingly comfortable, even before you consider further added extras such as the massage function, which I thought was fab. Just the ticket if you’re a stressed CEO! ‘Then the cooled air feature blowing through the little holes in the leather was, well, cool. ‘Surprisingly, I did find the space in the footwell tight when I was sat upright, which seems odd considering how long the car is. At least I could move the passenger seat further forward from where I was sat. ‘The ride quality was exceptional in both Comfort and Sport modes. I’m not the best of rear-seat passengers anyway, and sometimes cars that ‘glide’ along can make me feel a bit queasy. Not so with this Mercedes, even with the rear seat reclined as flat as it goes. 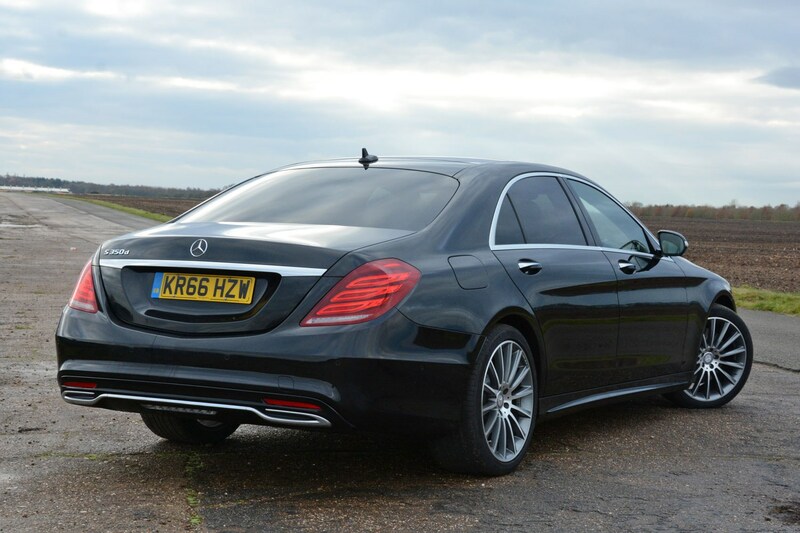 ‘Overall, the interior delivered with the quality I would expect to find in an executive car. ‘What a fab interior the S-Class has got. I loved how comfy the seats were – I could have easily fallen asleep! ‘I also really enjoyed the massage function, but having tried all of the settings, I don’t think as many different variations were needed. It just feels a little excessive. 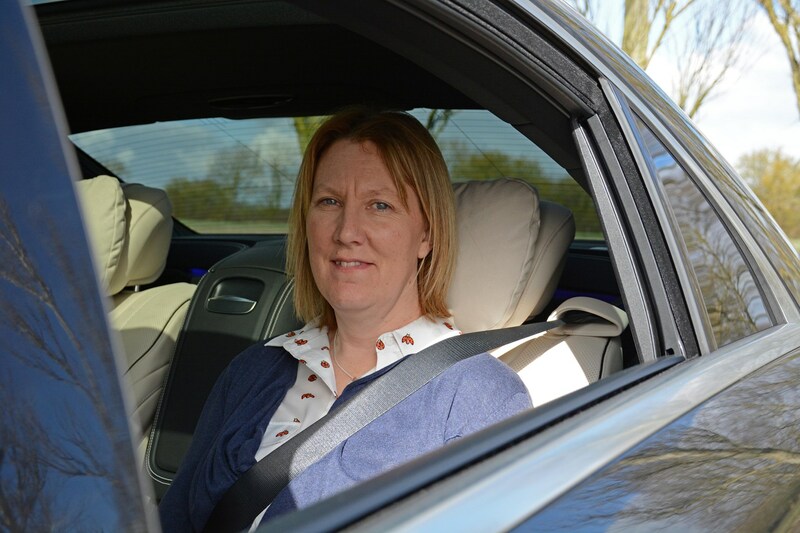 ‘Overall the Mercedes had a very comfy ride – even over rough surfaces it coped very well. ‘Being able to lie down in the back was a great feature – very relaxing. I feared I might begin to feel nauseous, but thankfully I didn’t. I just wonder how practical it would be for anyone over 6ft tall because it doesn’t feel as spacious as I initially expected. ‘I like the idea of having a fridge in the back, too, although the small size of the boot is a worry. If I was being chauffeured around I might well have quite a few bags of shopping to carry! 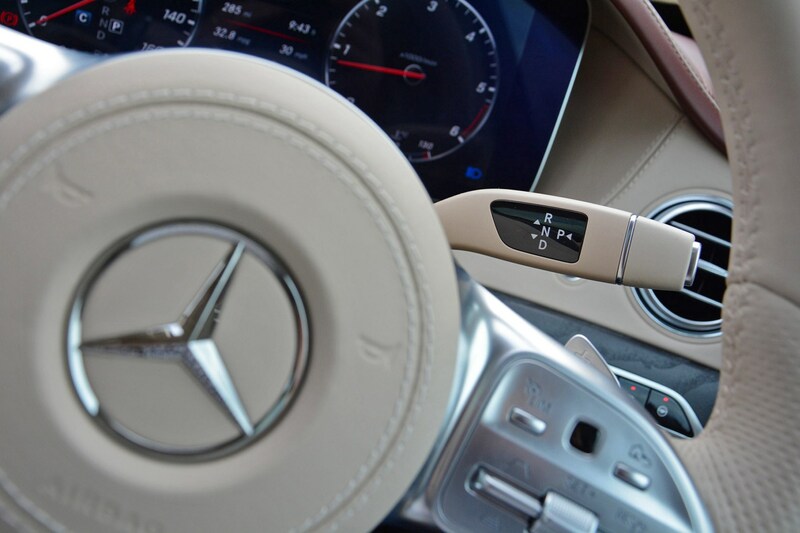 ‘Riding in the back of the Mercedes, it felt smooth – I rather liked how floaty it felt being a passenger in it. Everything seemed so quiet and peaceful. ‘I must say I wasn’t at all keen on lying down with the seat fully reclined. In fact, I felt quite queasy for most of the day afterwards. Also, when the driver has reclined the front seat back again just enough to see the door mirror, it seems much less practical – I can’t imagine it’s suitable for anyone of above average height. ‘The massage function? It was fun, but as far as I was concerned, no more than a novelty. I’m really not sure I’d spend £3,500 on the privilege. 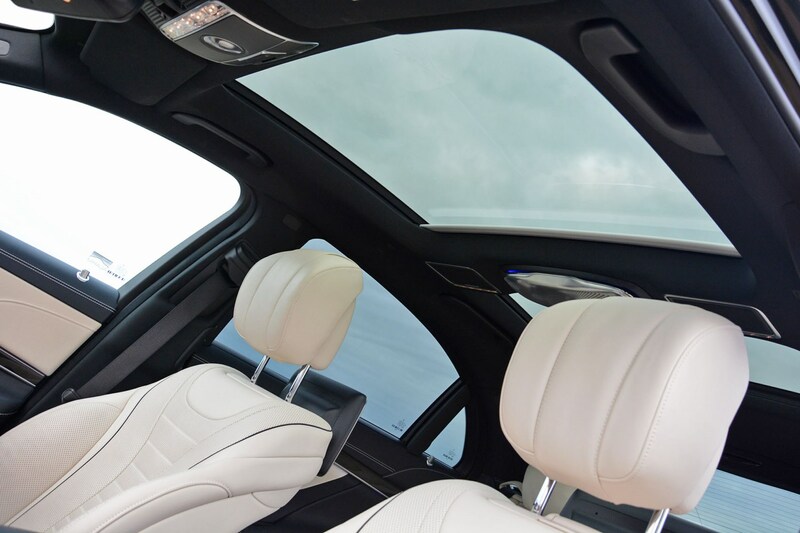 ‘I like that you can regulate the temperature of the seats quite easily and being able to control the window and roof blinds from the door was rather handy. ‘Even the fold-out table was fun. Like being on an aeroplane! ‘Rather appropriately Lady Penelope and Parker spring to mind! ‘What a luxurious way to travel with plenty of room – providing you’re sat up normally. In many cars I find I don’t have enough legroom when travelling in the back, but that wasn’t an issue in this Mercedes. ‘The massage seat was simply amazing, especially the hot neck and shoulder mode! ‘My sole criticism is that when the front seat seat was reclined a little to allow the passenger door mirror to be in sight, it didn’t leave quite enough room for my legs to stretch out fully. This was okay for a relatively short journey, but I’d be less impressed on a longer trip. ‘It definitely has everything you could possibly need for longer chauffeured jaunts, though: fridge, table, DVD player, blinds, the list goes on... Although you obviously pay a lot for the privilege. 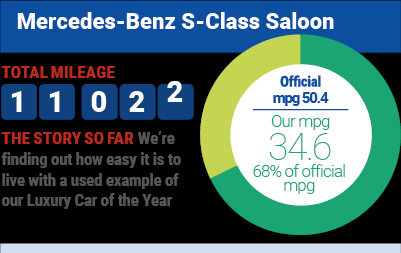 Well, it was hardly a scientific experiment that would stand up to the rigours of objective scrutiny, but subjectively from my sample of four, the luxuriousness of our long-term S-Class observed and appreciated. The comments about the lack of room seemed surprising, though, so I tried my 6ft frame in it. Sure enough, sat in a conventional position it was fine, but by the time I’d reclined back into ‘business class’ mode, my feet were up against the back of the front passenger seat – and that’s before it had been reclined a little for the driver’s visibility. Two conclusions can be drawn from this: firstly, to truly experience how comfortable the fully reclined seats are in our S 350 d AMG Line L, you need to be 5ft5in or less and secondly, if you’re taller, then the even longer Mercedes-Maybach S-Class with its extended wheelbase is what you need. 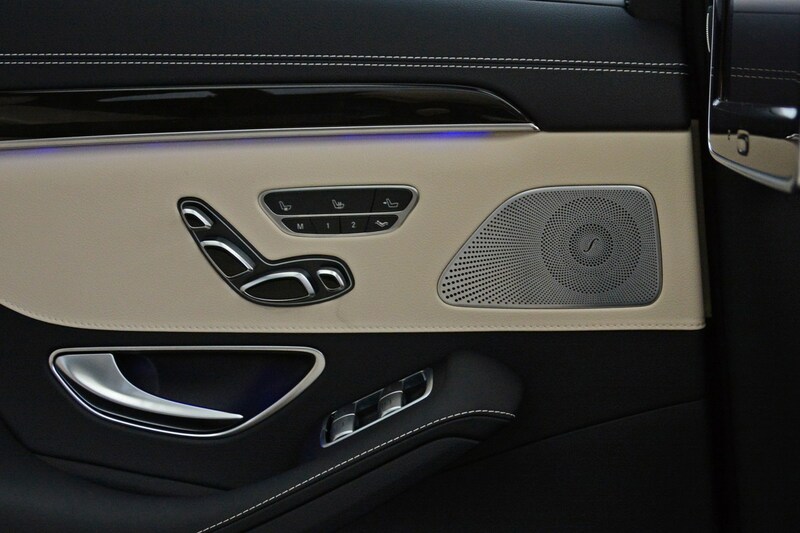 Is the S-Class's upgraded Burmester sound system worth the expense? We didn’t have much spare cash as a family when I was growing up, hence it was the tail-end of 1991 before we had a compact disc player in the house. My old man was more of a vinyl man anyway, with thousands of Elvis (Presley, not Costello) LPs, EPs and seven-inch singles; he didn’t have much appetite to replicate his musical archive in CD format. What does this have to do with Parkers’ long-term Mercedes-Benz S-Class? Good question (and one my Editor’s probably asking, too). The answer lies in our S 350 d’s upgraded sound system and the need to conjure up superlatives worthy of the extra £5,300 it cost new that will out-score my old man’s CD missive. That’s right, just over five grand on a sound system upgrade. 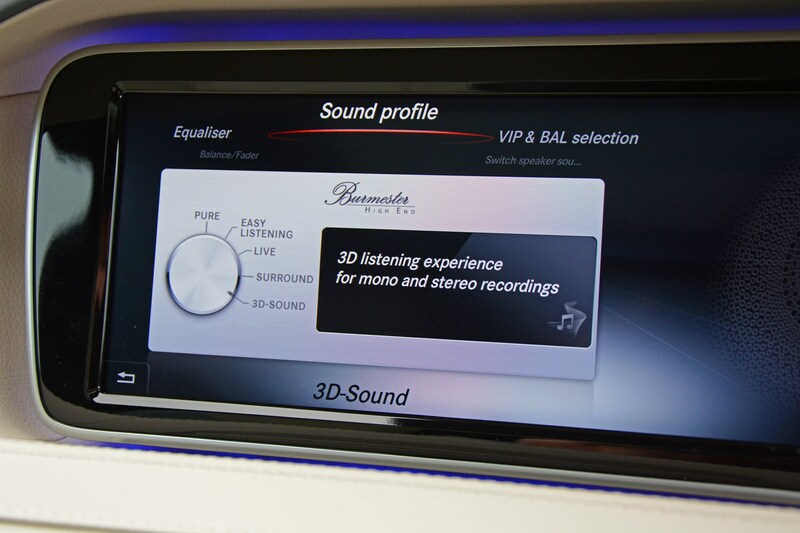 In anyone’s book that’s a lot of money, but in the context of a car that cost more than £103,000 with its other options added, it’s all within reason for the Burmester high-end 3D surround sound system, to give it its full title. Five grand? Do you get an orchestra playing live for you for that? Having pored over the specification sheet – as well as the S-Class itself – it appears not. What you do get is a suite of 24 speakers strategically placed around the Mercedes’ plush cabin, as well as one mounted in the boot. Together, using a 24-channel amplifier as a conduit, they combine to produce a not insignificant output of 1,540 Watts. How loud is 1,540 Watts? Also, when did it become okay for kids to tell their parents off for making too much noise? Naturally, there’s a vast array of adjustability of not just volume, but also bass, treble and balance, with your passenger(s) being chauffeured in the back also able to take control of the system via a remote. Even taking the volume levels as high as my ears could comfortably cope with – and taking into consideration the slight muffling caused by the follicle sprouting that affects a man once he’s headed north of 40 – the sound reproduction is by far the best I’ve yet experienced in a car. It’s not unknown for me to go for a drive, simply with the intent of parking up for half an hour, reclining in the back with some of John Williams’ better-known film scores reproduced in exquisite refinement for company. And so what if that’s how I get my kicks these days..? You certainly don’t miss the glitzy speakers, do you? 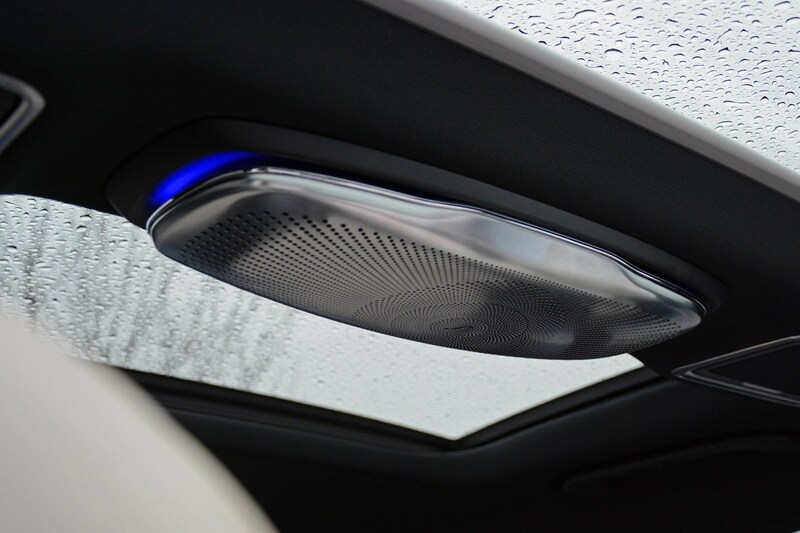 Despite a polished metallic finish for the majority of the speaker grilles, whether they’re located in the doors or in the roof, the majority of the Parkers team felt that they looked classy, rather than ostentatious – it’s certainly a perspective I subscribe to. From previous updates you may have clocked the little tweeters in the bottom corners of the front door windows – these are the system’s visual party piece. Not only are they haloed with a ring of light matching the colour of the ambient glow elsewhere in the cabin, they rotate outwards by 10mm when the sound system is switched on. It looks gimmicky, but Mercedes claims that the extra length provides ‘optimal sound impression’. 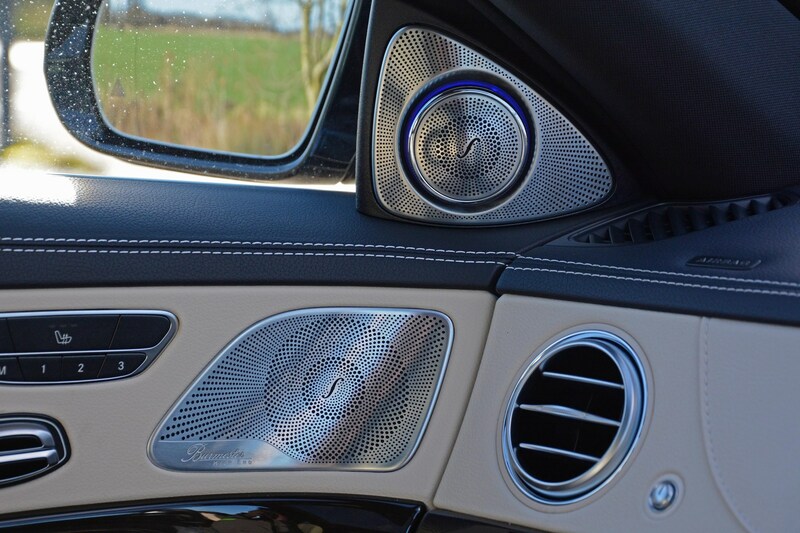 Does the Burmester system do anything else? Funny you should ask, because the answer’s yes. 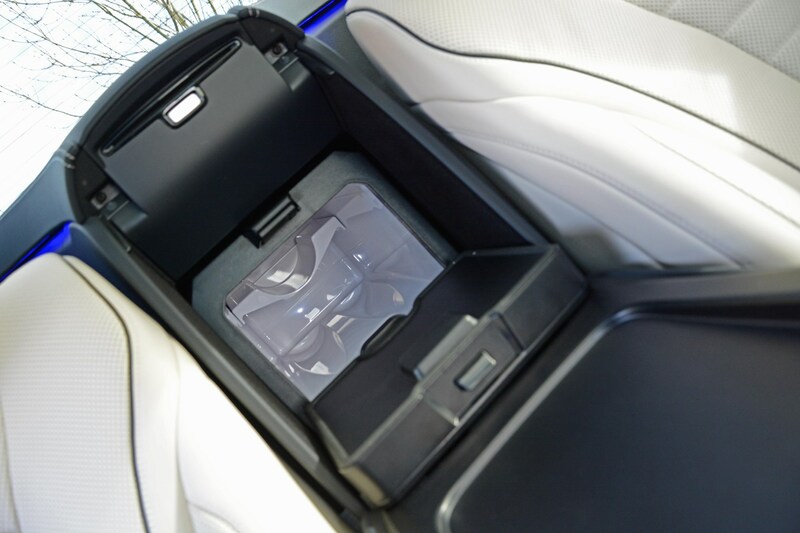 Just like the V-Class long-termer I previously ran, the package can use the same microphones located above the driver and front passenger to live broadcast voices through the speakers to those sat in the rear. While in the V-Class this was genuinely useful given the vastness of its interior, in the S-Class it feels like overkill, especially as the cabin is already significantly quieter anyway. Still, it means on school runs, children #2 and #3 have less of an excuse when they claim not to have heard my instruction to ‘stop faffing with all the buttons’. Overall the Burmester’s worth it then? Is there are case for not upgrading to this Burmester high-end package? 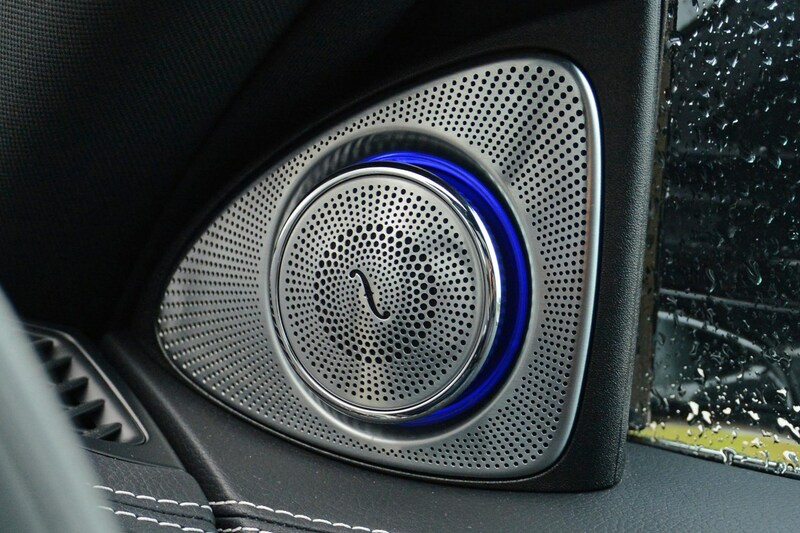 If you’re not much of an audiophile and you’re buying an S-Class primarily for personal use, rather than chauffeuring, then maybe there’s a vague whiff of an argument. 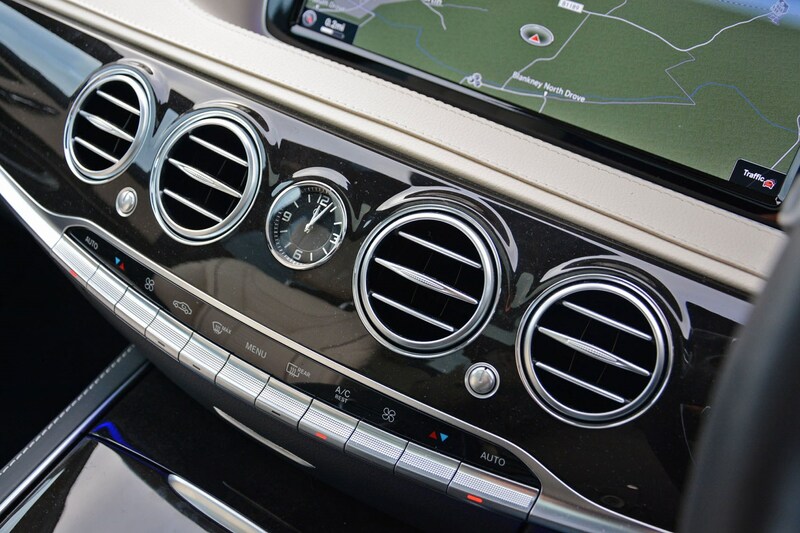 Otherwise, S-Class buyers should have this package firmly at the top of their must-have list. It’s simply that good. Now, when I say I turned to see a sales executive called Jamie, this alone won’t mean much, so allow me a moment to give some background information. Jamie is a former student of mine from my previous life as a teacher. Occasional glimpses on Facebook had informed me that he was working in car retailing, but this was the first I knew he was working at a Mercedes dealership. And here he was hoping I was going to buy something from him. Did you help your former student edge closer to his sales target? Sadly not. As attractively priced as many of the models were, three teenagers are a drain on my modest journalist’s salary (get the violins out), and my long-term S 350 d AMG Line L is as near as I’m likely to get to knowing what Mercedes ownership feels like. Instead, I distracted Jamie – or tried to, at least – by telling him all about what the S-Class had been like to live with and finding out which of the demonstrators he’d enjoyed driving since he joined the franchise. Clearly the consummate sales professional, Jamie deftly returned the conversation back around to the used cars to see if there was any way of prising money from my tight-fisted grasp. As he extolled the virtues of Mercedes-Benz’s Approved Used scheme, it struck me how little I knew about the programme. ‘Can we go indoors so that you can tell me all about it?’ I asked – sure enough, moments later I was interviewing Jamie for the first time since his Sixth Form induction. What is Mercedes-Benz Approved Used? The prospect of a car that’s as close as possible to being new in terms of the condition it’s in, but at a substantial cost-saving compared with a factory-fresh example sounds too good to be true, but that’s what this programme endeavours to deliver. ‘This is a really beneficial aspect of what Mercedes-Benz Approved Used is all about. However old the car you’re buying through the programme is, you have the peace of mind to know that it comes with a year-long, unlimited mileage warranty. ‘If you’re unfortunate enough for it to break down, we also give you up to £100 per day for a maximum of seven days per year towards the cost of hiring a car to keep you mobile. ‘If we expect it to be a short-term fix, we’ll supply a loan car from within our service department. 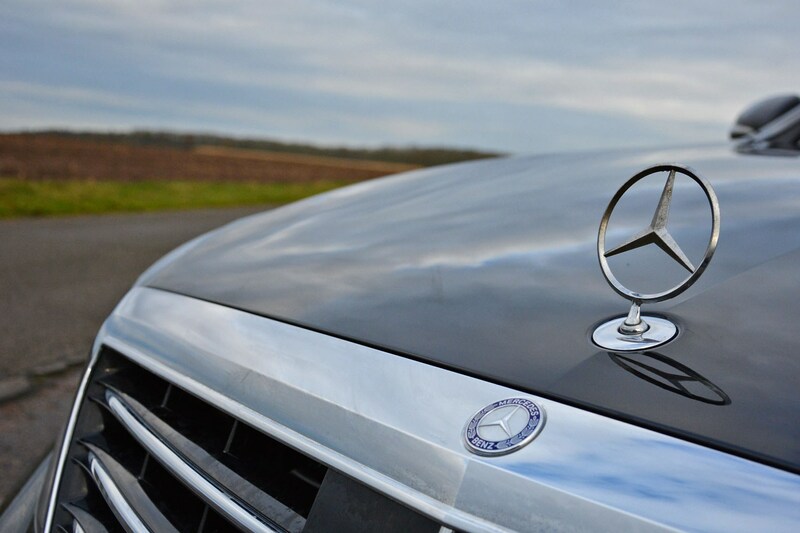 ‘Alongside the warranty provision the package comes with roadside assistance for the first year of ownership, however an additional 12 months’ worth of cover can be topped-up by having your Mercedes-Benz serviced at an official retailer. ‘Providing customers keep having the service work carried out at Mercedes retailers, the roadside assistance will last for the lifetime of the car. 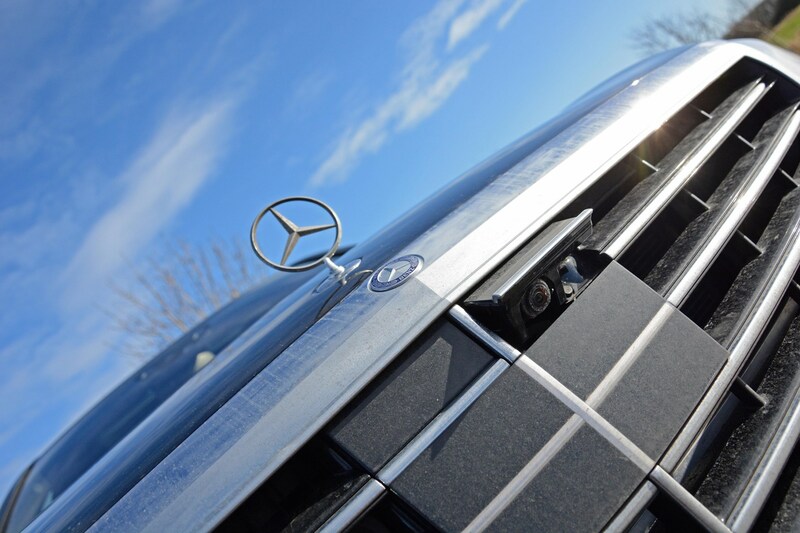 ‘Before a used Mercedes becomes an Approved Used Mercedes, we give it a thorough inspection in our workshop using fully certified technicians. ‘Each car is subjected to having 165 aspects of it being checked over, not just fluid levels and mechanical parts, but also that every item of equipment is working exactly as it should do. It’s incredibly comprehensive. ‘Once those aspects have been checked and any necessary work has been undertaken, the car then goes to the paint shop for any remedial work to the bodywork and alloy wheels to be carried out, followed by a thorough valeting. ‘Other than general wear you’d expect from a car that’s not brand new, our Approved Used stock is prepared to a very high standard. ‘This work is also carried out before potential customers see the car, so they know what they’re looking at and road testing is ready to go if they decide to buy it. We don’t have a single car on the forecourt that’s not been thoroughly checked and approved. ‘Aside from when we get more cars traded-in during March and September, the workshop can usually turn a car into an Approved Used Mercedes-Benz within three days. ‘Sometimes we decide not to send cars to the workshop, particularly those that have accident damage recorded against them when we perform the Experian finance and HPI history checks. This also confirms the mileage which we cross-check against the National Mileage Register. ‘With so many cars featuring keyless entry these days, people tend to handle their car keys less, keeping them in their pockets or bags. 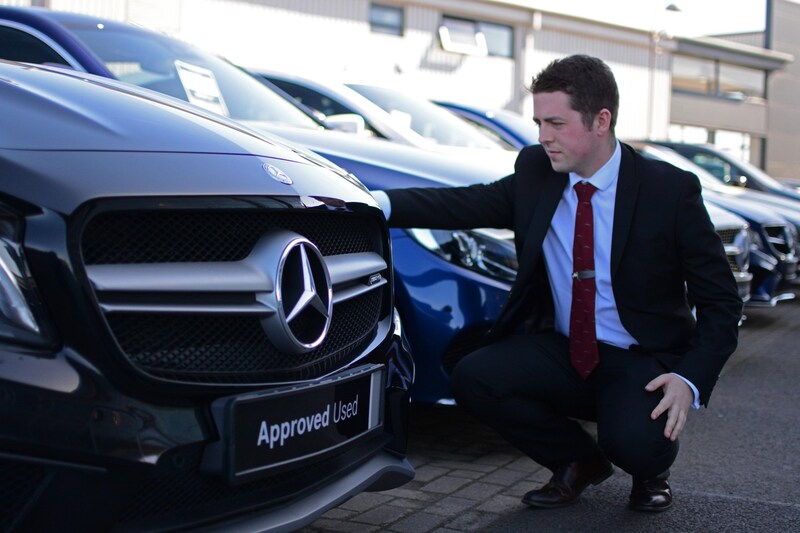 ‘Each Approved Used Mercedes-Benz comes with a week’s worth of free insurance, but we can also provide a quote for a full year’s comprehensive cover. So, did you leave Jamie a sale closer to his target for the period? 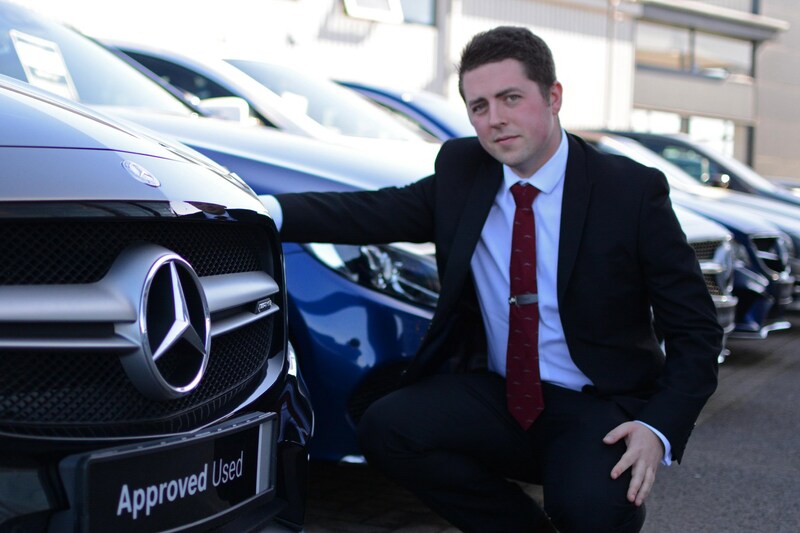 ‘Approved Used Mercedes-Benz cars are slightly more expensive than those you might find at an independent second-hand car dealer, but the premium is small considering the level of peace of mind customers get. They’re buying a lot of reassurance as well as a great used car,’ concludes Jamie. Oh! Jamie tells me children aren’t accepted as currency. We say goodbye to our long-term S-Class – will it be missed? Spending six months in the lap of automotive luxury sounds fantastic, doesn’t it? 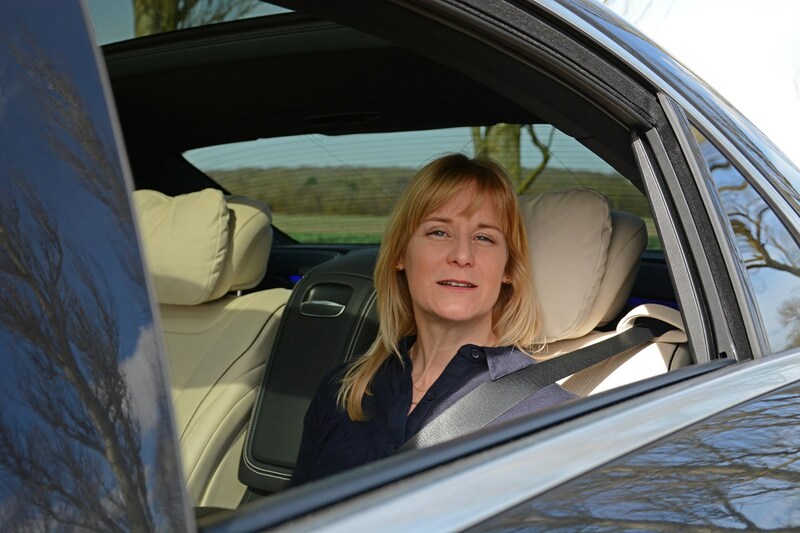 When I became the custodian of Parkers’ long-term Mercedes-Benz S-Class Saloon, I was particularly intrigued with finding out how easy it would be to live with on a daily basis. Now, having passed the keys back, I can reflect upon what half a year of motoring swank was really like. 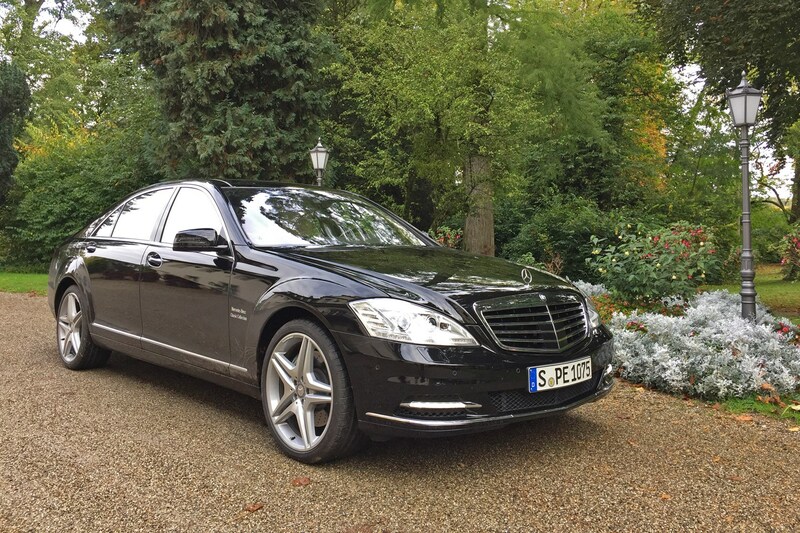 Isn’t the Mercedes-Benz S-Class simply too big? 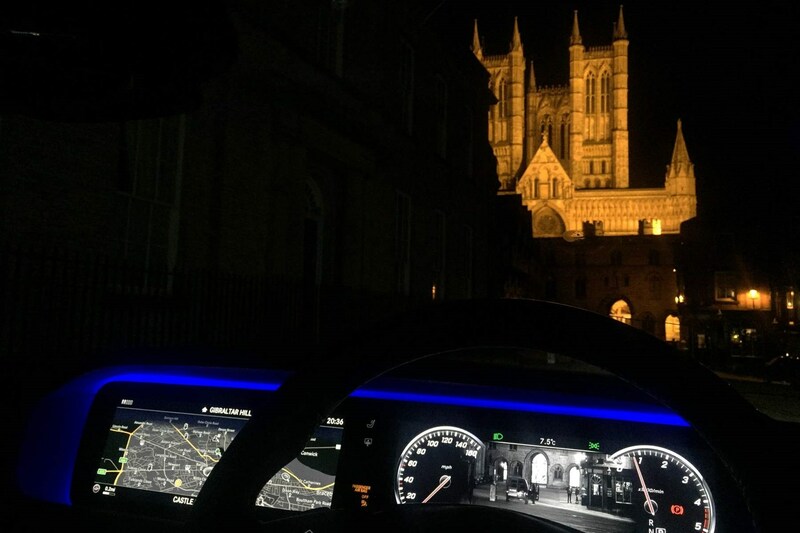 The nearest city to where I live is Lincoln, which, as those of a historical bent among you will know, has many Roman- and Norman-era roads that aren’t famed for their width, even before the kerbsides are lined with parked cars. 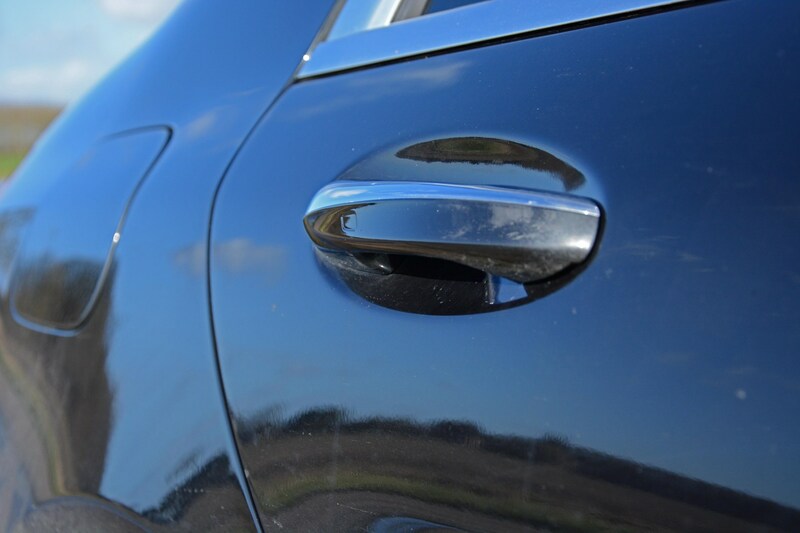 Despite being broad (2,130mm from one door mirror tip to the other) and long (5,246mm from nose to tail), our S 350 d AMG Line L never felt anything other than supremely manoeuvrable. 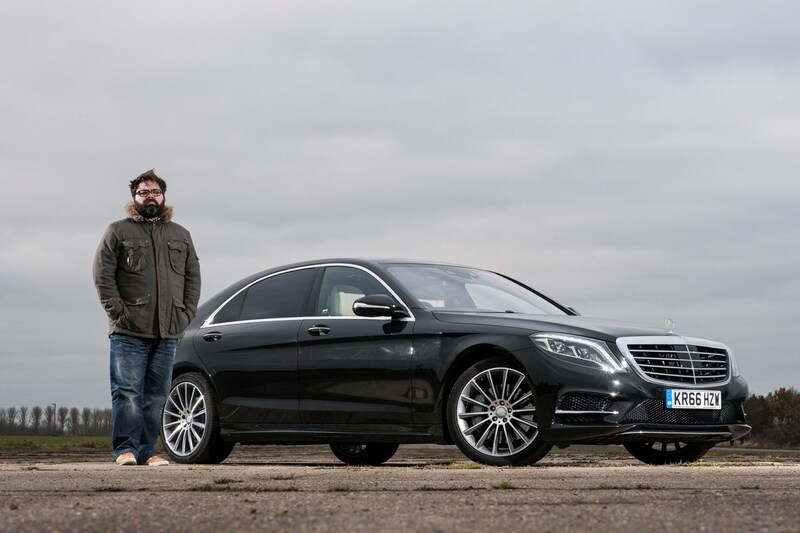 It’s a hackneyed motoring journalists’ cliche to suggest that the S-Class shrinks around its driver, but it really doesn’t feel significantly larger than the E-Class one size below it. Visibility from the driver’s seat is excellent and at 11.9m, its turning circle is usefully compact – even narrow multi-storey car parks didn’t invoke a sweating bout like Diane Abbott in a maths exam. And even if it did, the optionally air-conditioned seats would have soon restored a perspiration-free equilibrium. Okay, but what about Mercedes-Benz S-Class running costs – surely it's thirsty? 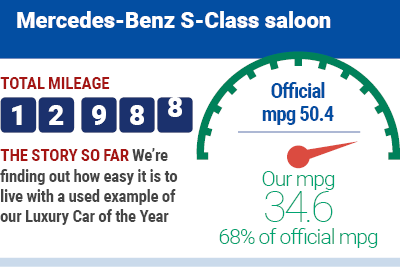 Over the course of 14,808 miles with our S 350 d, it chewed through 1,946 litres of diesel at a cost of £2,411, plus 22 litres of AdBlue adding a further £19.58. In diesel consumption terms, that equates to 34.6mpg, which compared with a typical, mainstream family hatchback that would easily trump that to the tune of at least 10mpg, it’s not great. But, this isn’t your common-or-garden five-door for parents with 2.4 children. It’s a prestige saloon, packing a 258hp 3.0-litre engine with an overall kerb weight of 1,955kg. 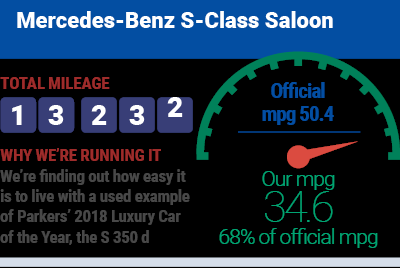 In that context, 34.6mpg isn’t bad at all, although it’s worth remembering that’s significantly shy of the 50.4mpg official claim, flaws in the outgoing testing procedure aside. However, accounting for just fuel and AdBlue, the S-Class has cost 16p per mile to run – which for a large, luxury saloon is remarkably good value. As our time with the Mercedes coincided with the colder part of the year, we also arranged for a set of Pirelli Sottozero winter tyres to be fitted, which would set you back around £1,110 for four. 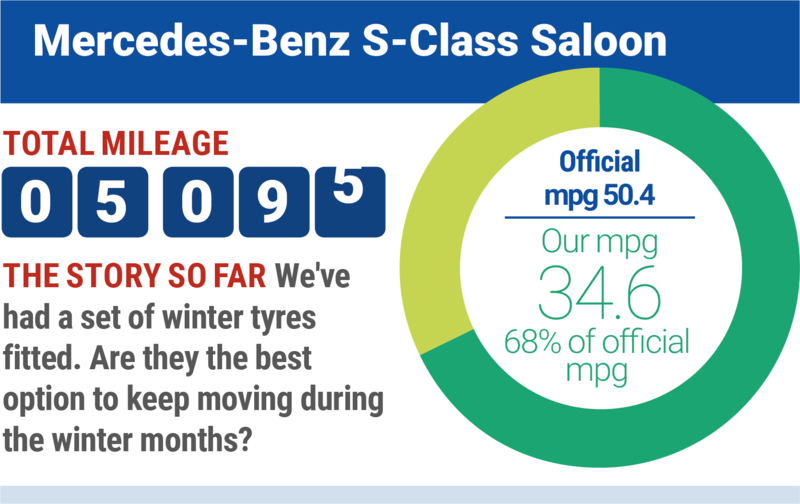 Although winter tyres aren’t a legal requirement in the UK, they are especially effective – even if it’s not snowy – particularly on a rear-wheel drive model such as the S-Class. 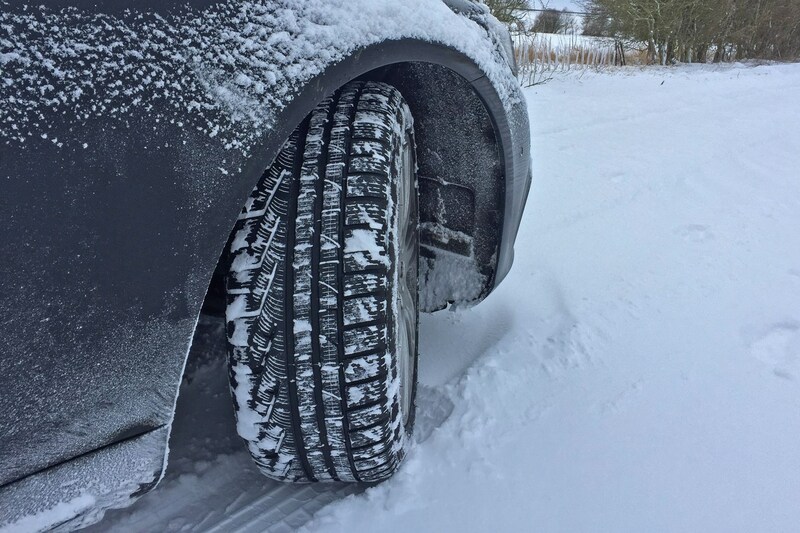 Adding in the cost-per-mile for the cold weather tyres is trickier, because their price would be amortised over more than one winter. Assuming they were used over two winters (halving the £1,110 bill to £555) they increase the overall cost to 20p per mile. 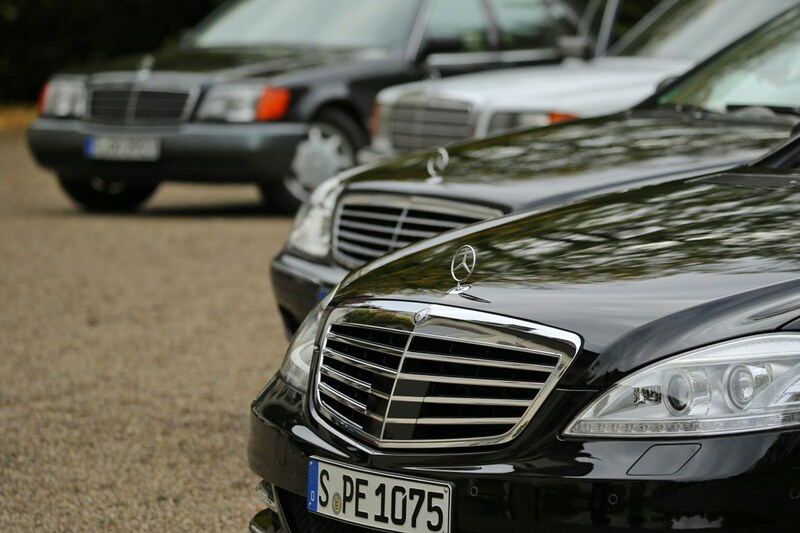 What about the hidden cost of Mercedes-Benz S-Class depreciation? 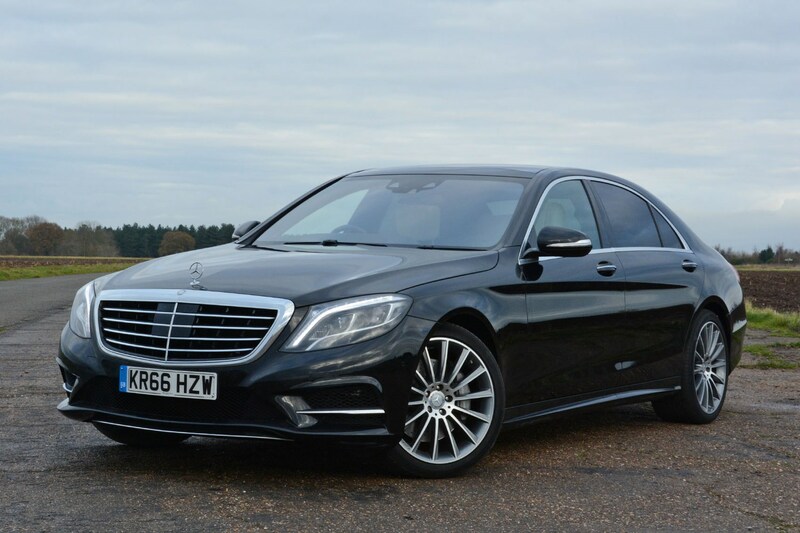 Finding a comparative super-spec S-Class to our S 350 d is tricky – as an ex-press car designed to show off a plethora of features that could be added new as extra-cost options, very few (if any other) examples will be so comprehensively equipped. 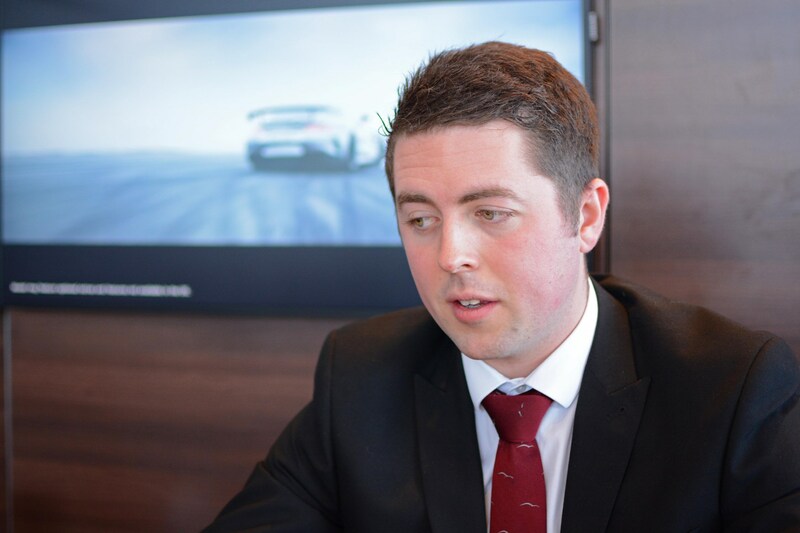 But, using Parkers’ used car pricing expertise, our guidance is that it would appear on a Mercedes-Benz retailer forecourt for approximately £54,000, given that it was 18 months old (at the time of writing) and having covered a total of 20,000 miles. Considering that it had a notional retail value of £73,500 when it joined us at 12 months and 5,000 miles old, the cost-per-mile (including depreciation fuel, AdBlue and tyres), works out at £1.52. Compared with its new price, it’s lost 50% of its value. 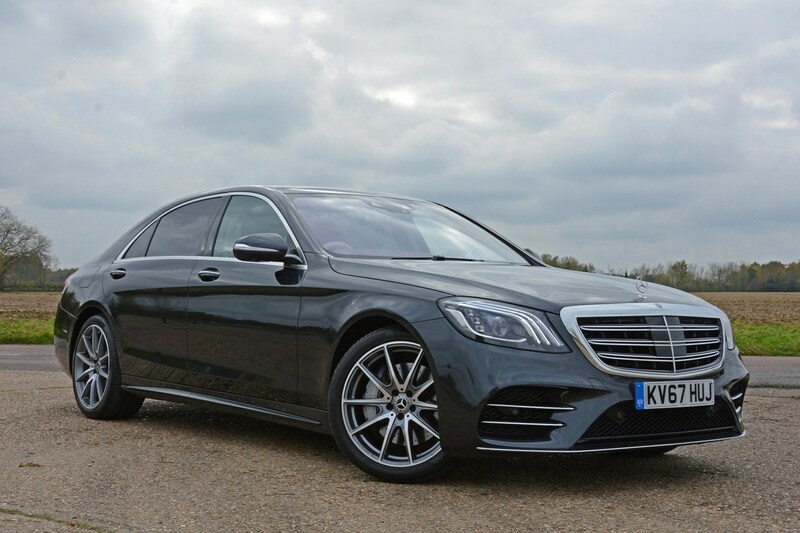 Ranked alongside an AMG S 63 model, which would retain 48% over the same period and an AMG S 65 at 43%, the entry-level diesel is the pick of the range from a residual value perspective. 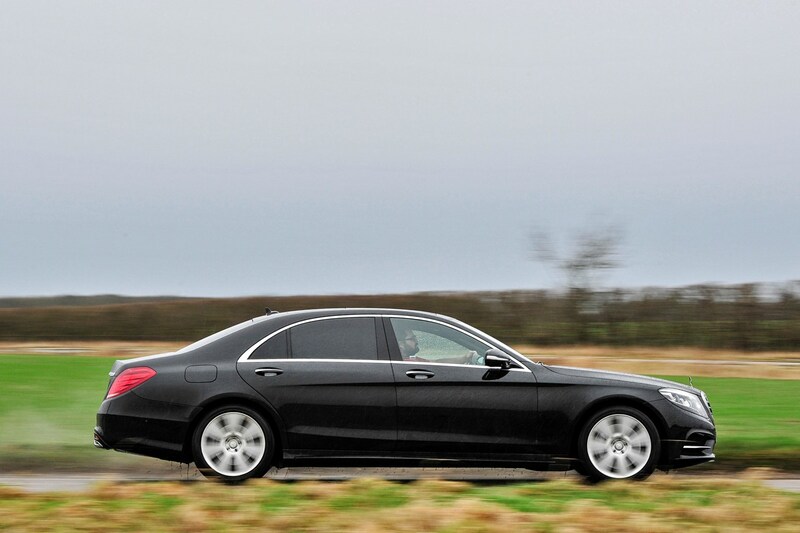 Is the Mercedes-Benz S-Class’s practicality compromised by those reclining rear seats? 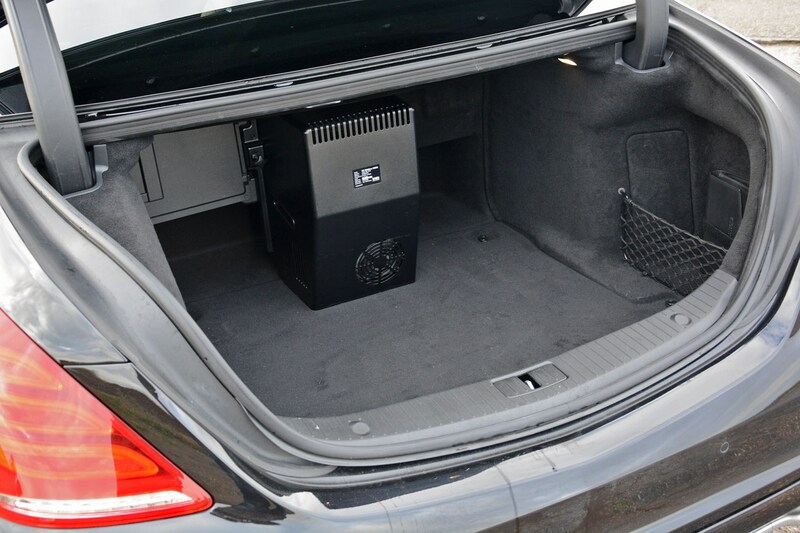 Four-door saloons aren’t known for their ability to carry large loads due to typically restricted access to the boot space, but while the long-wheelbase S-Class’s dimensions should make it feel exceptionally spacious, some of the optional extras fitted do restrict the available volume. 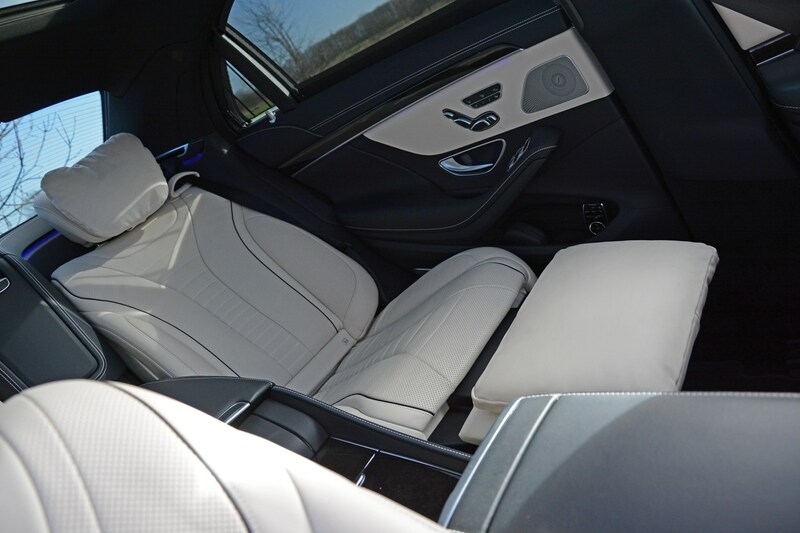 Those individually reclining rear seats have turned our S-Class from a five- into a four-seater, but they also reduce the amount of legroom as they have to be set further forward in the cabin in order for them to be angled backwards. If outright space is more important to you – or more specifically, your passengers – than a Business Class flight experience, stick with the standard rear bench. It’s a similar situation with the fridge that nestles between them, because the majority of the appliance is in the boot, robbing it of space. Again, it’s fine if you just need to carry a couple of small suitcases, but much more than that and you’ll struggle. Avoid the fridge if you’ll need to carry big cases. So which options would make our top three must-haves? That’s easy – the ones that make an incredibly easy-to-live-with car even more painless an experience. There’s an argument that the first two mentioned below should be standard equipment anyway, but at the time our S 350 d AMG Line was new, they weren’t. 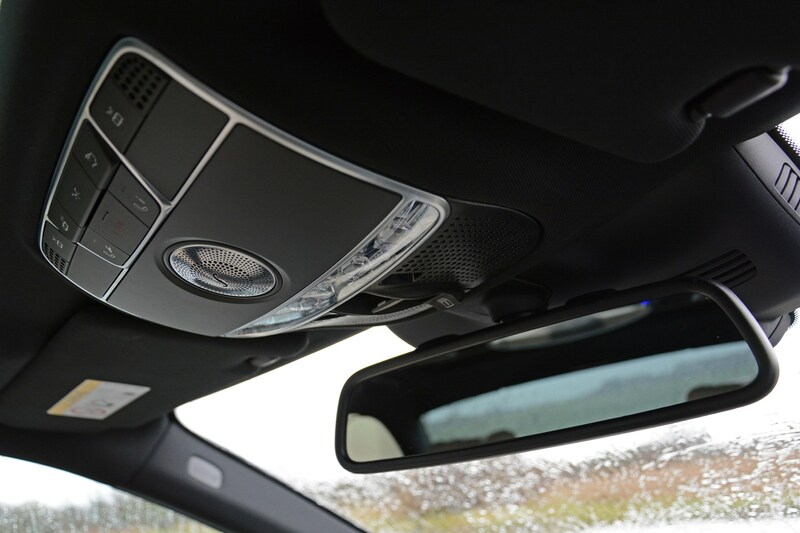 First up is the 360-degree camera system, essentially to make the S-Class’s extremities easier to judge – useful as the bootlid isn’t visible from the driver’s seat. It does tend to skew the image displayed on the multimedia screen a little, making you look a bit foolish when you park obliquely between parallel lines, but you soon learn to adapt to that. Note that newer, facelifted S-Classes employ higher definition cameras for a crisper image. Our second choice is the Driving Assistance package, comprising of a number of aids to keep you safe, in lane, and away from collisions. 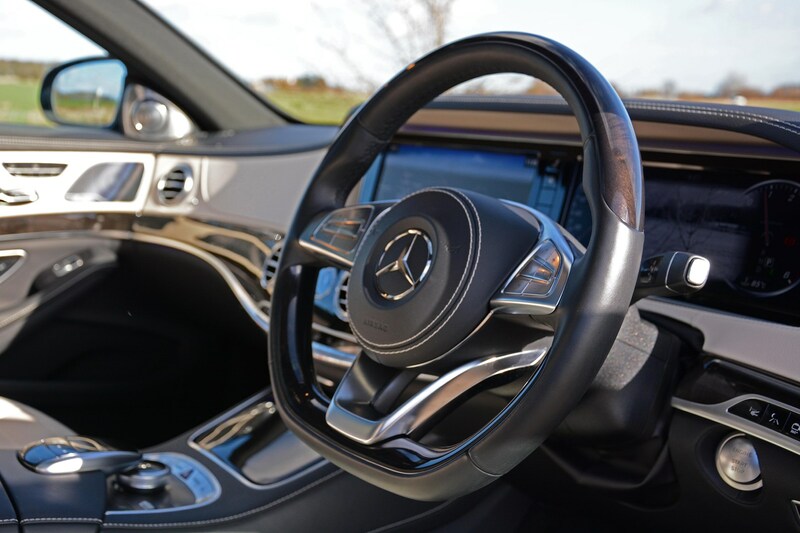 The adaptive cruise control is particularly effective and, unlike post-facelift S-Classes, isn’t linked to the speed limit recognition system, making it far smoother and predictable. And finally, the Night View Assist Plus system – essentially a night vision camera with a display that appears between the main instruments. 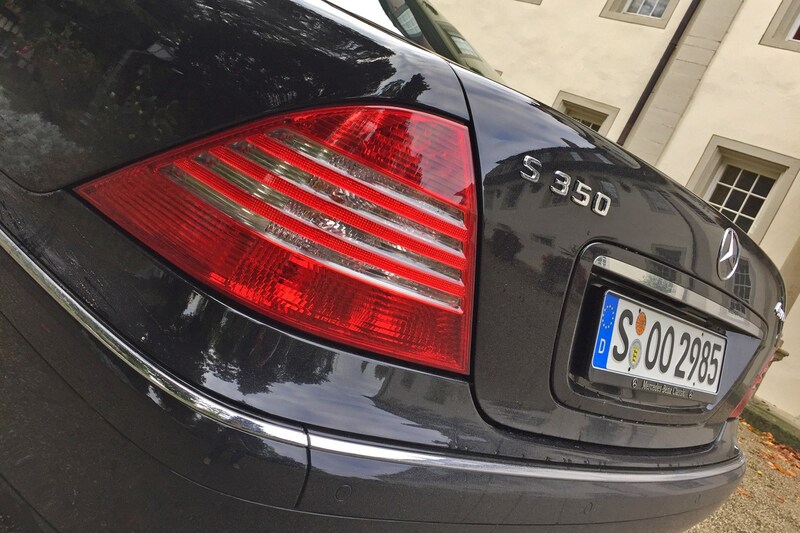 I never drove the S-Class after dark without it, finding it nothing but beneficial, despite the brilliant luminosity of the adaptive LED headlamps. On at least two occasions it picked up large, wild animals loitering at the roadside, allowing me to modify my speed and position with plenty of warning. It’s no longer the newest luxury car on the block, but that the Mercedes-Benz S-Class remains the default choice is a testament to its depth of quality. Is the latest-generation Audi A8 better? In some regards, yes, but if you’re considering an Approved Used S-Class as old as our one, then it trumps every direct rival – including the previous iteration of A8. 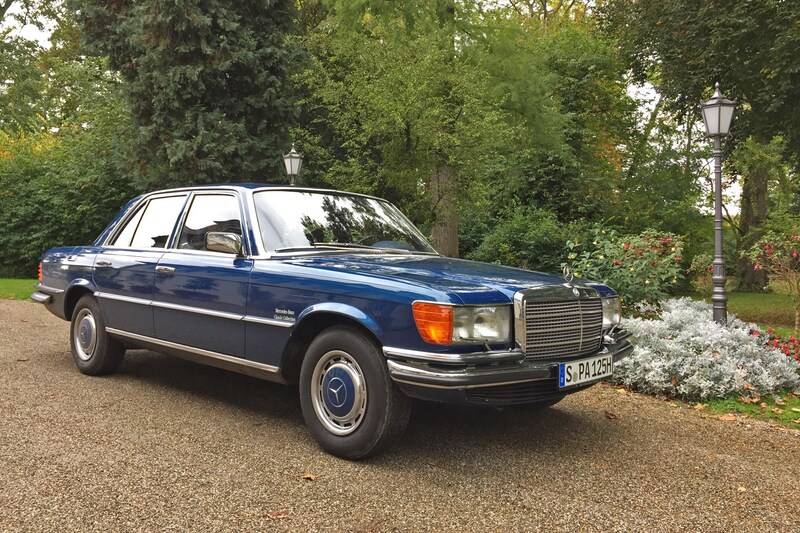 But back to the original question: is the S-Class easy to live with as a daily driver? Unfailingly so. Yes, it’s long, but it never feels anything short of being a doddle to drive and, providing you’ve specced the options highlighted above, never feels remotely daunting from behind the wheel. The only thing that remains for me to do is to set up a Just Giving page in order to be able to afford one.